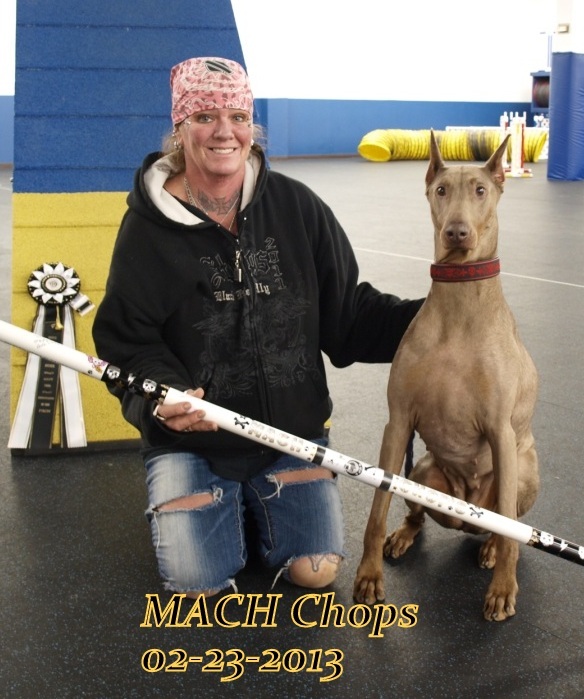 Chopper is now a Masters Agility Champion !! 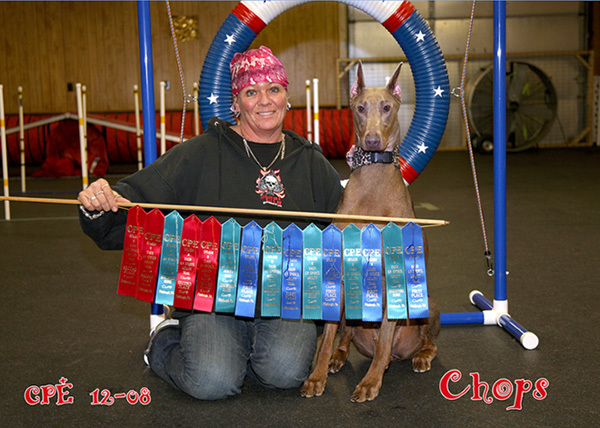 This is something i was really looking forward to getting with Chops.Me & Chops started agility together.We both learned it together and we made mistakes together .So this was very special moment to me ! 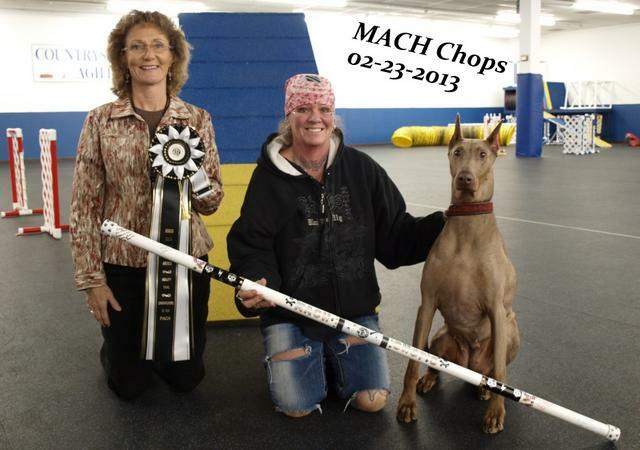 This was 1st Dog i ever put a Mach on.I will never forget how great it was getting there with Chops! 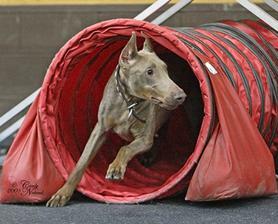 Chops really loves agility & i love running her !! 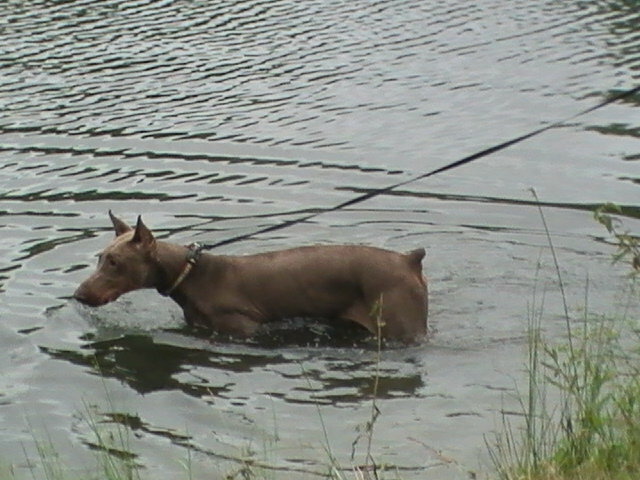 I am so blessed to have a dog like chops! 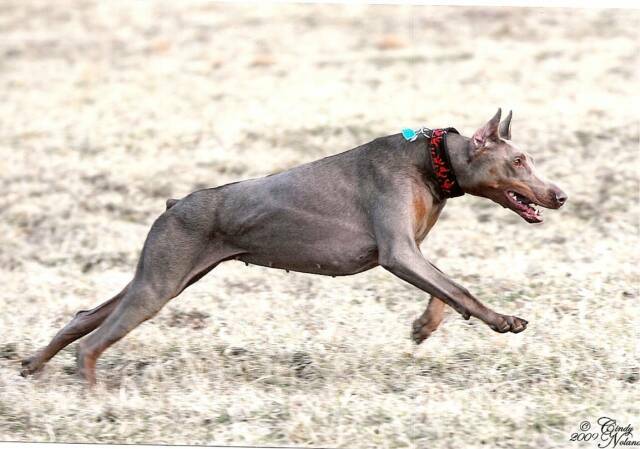 She is now going to be 13 years old and she is retired from Agility.She still runs around and is doing great .She Loves her life of just going places with me and playing ball in the yard. 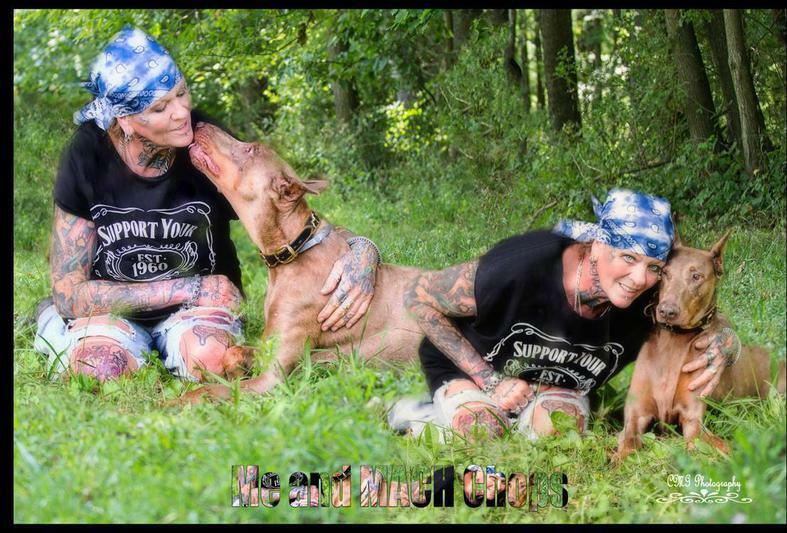 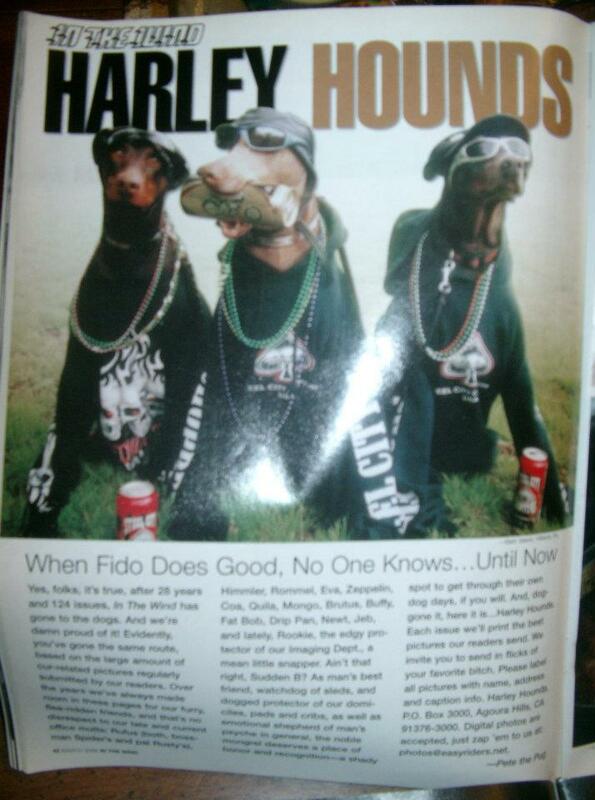 Charnea,Cheyenne ,Chelsea .This picture was in magazine called "In the wind"
In memory of the ones who were a big part of all of this , they are all missed very much & will not be forgotten !! 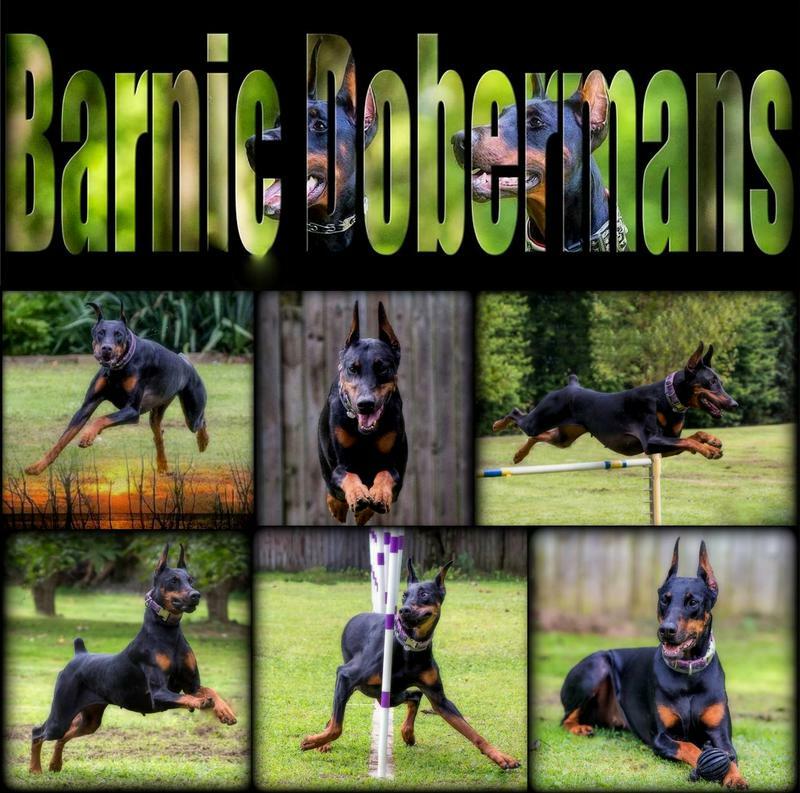 "All content of this website is copyrighted and owned by Barb Valerio. 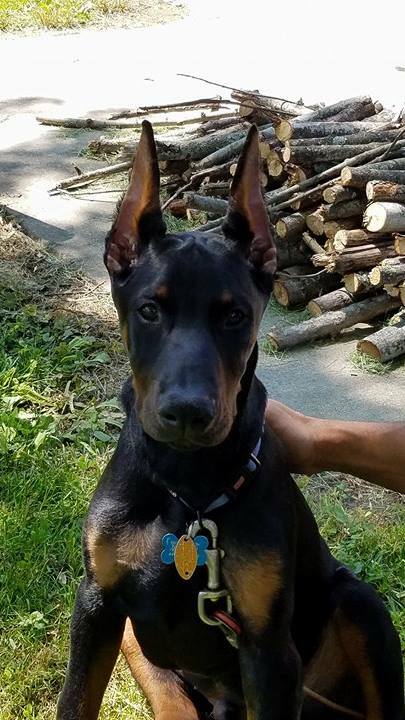 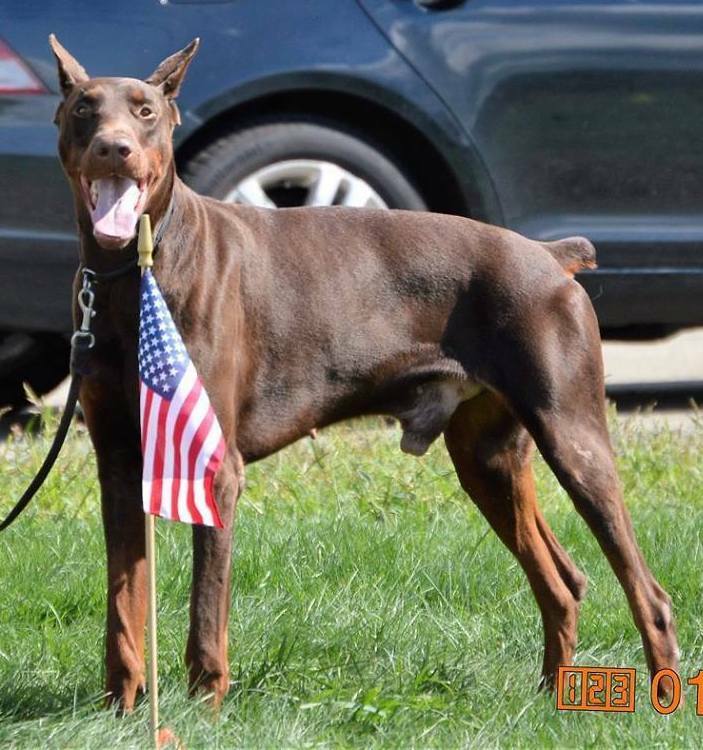 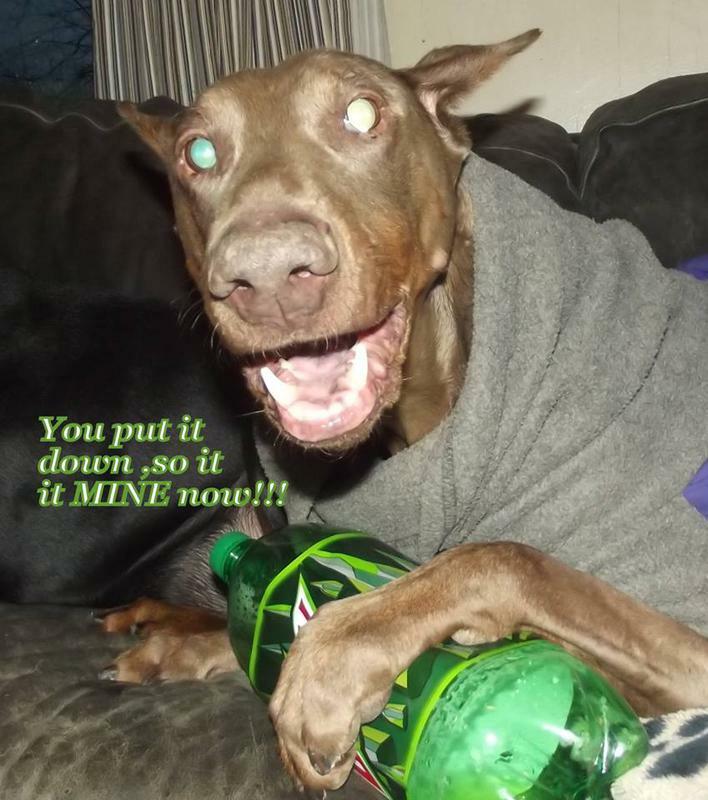 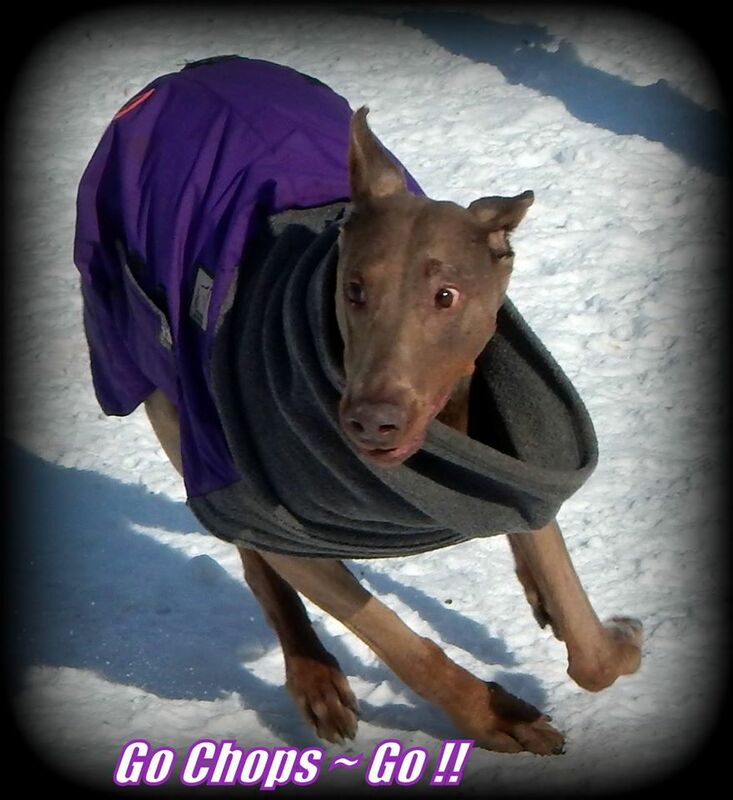 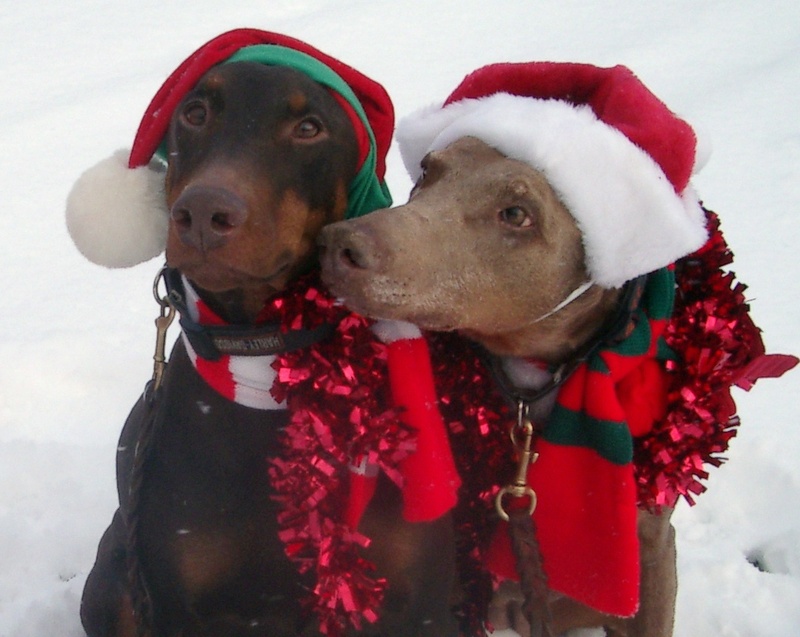 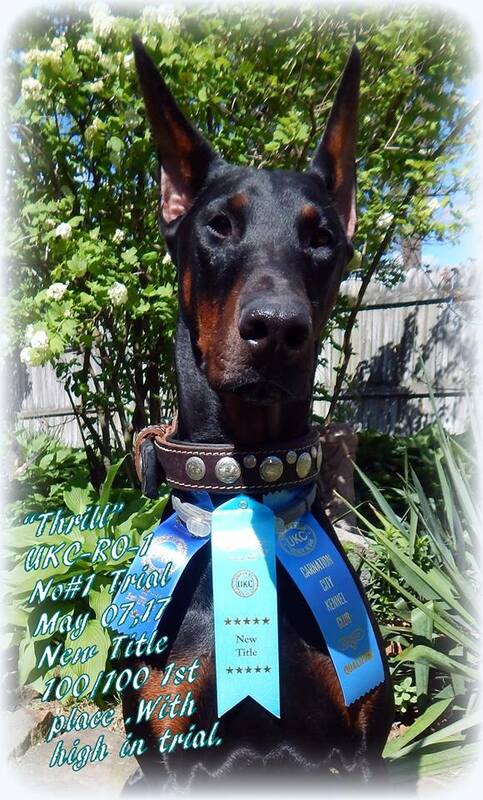 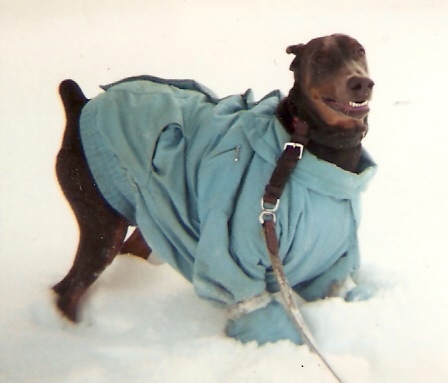 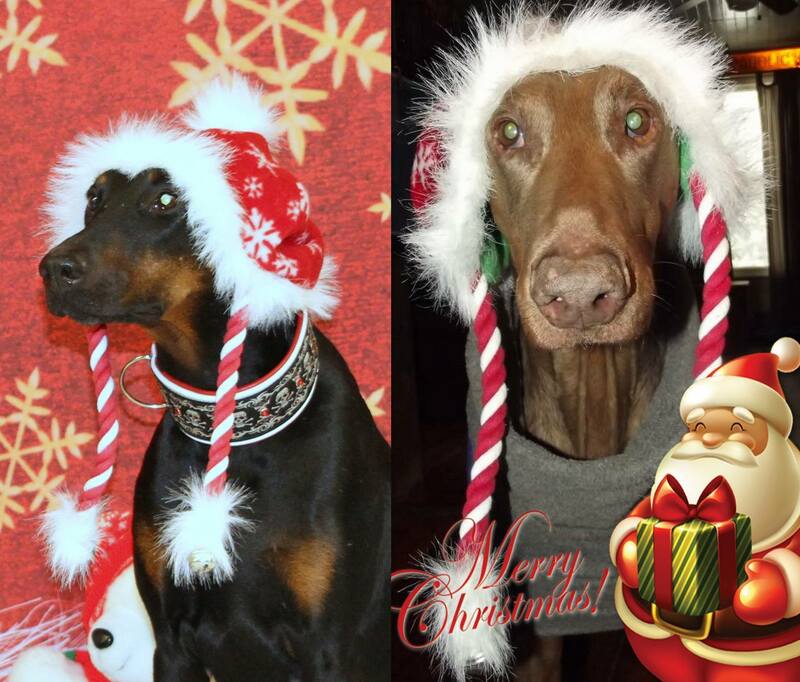 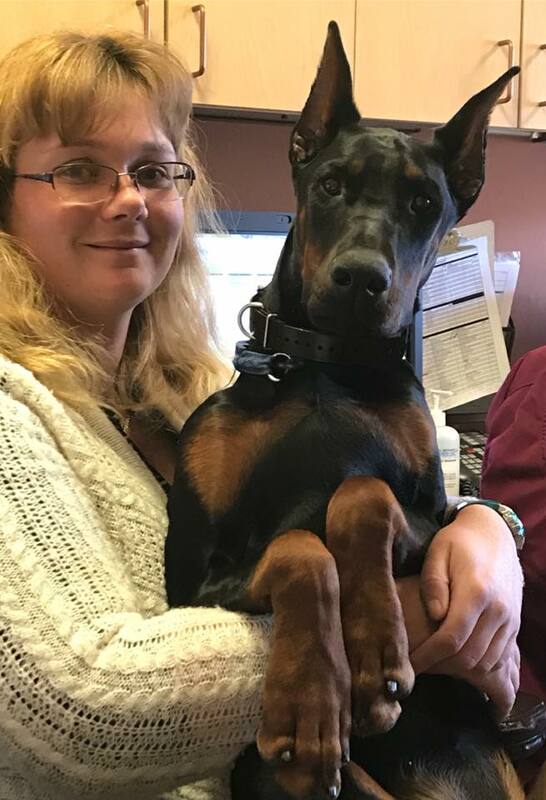 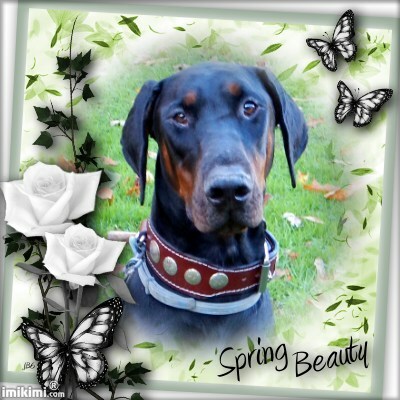 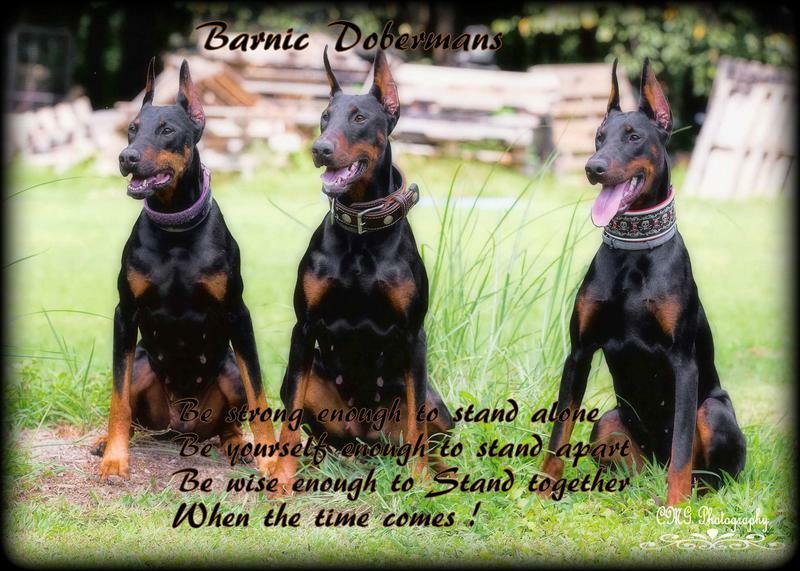 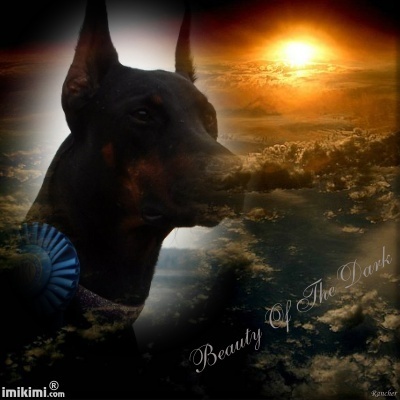 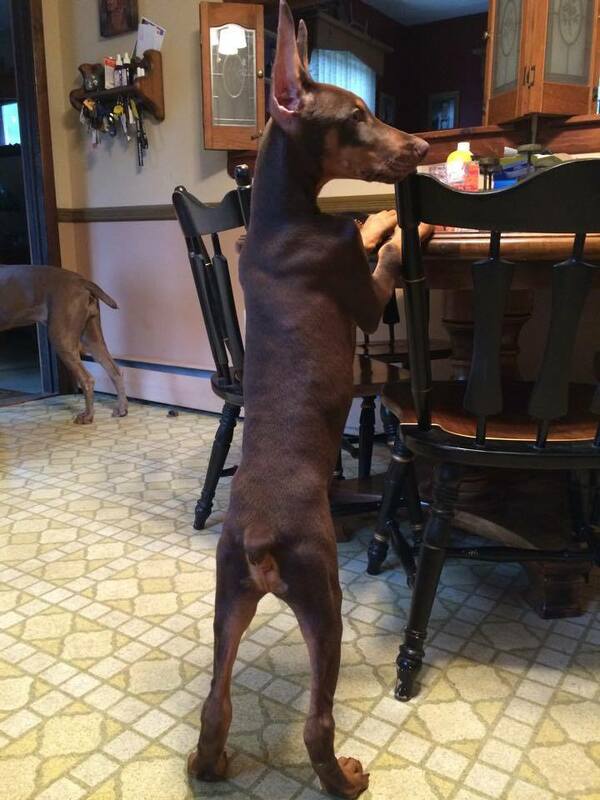 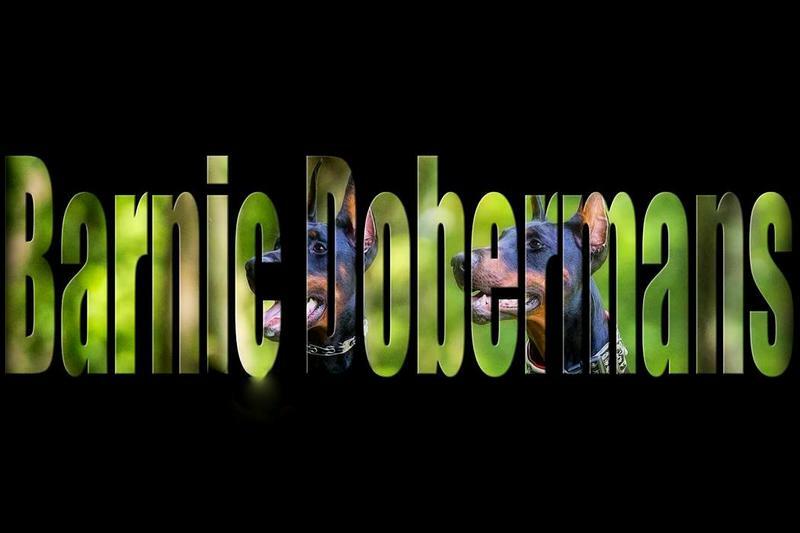 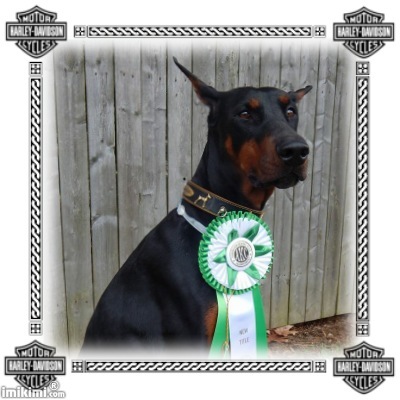 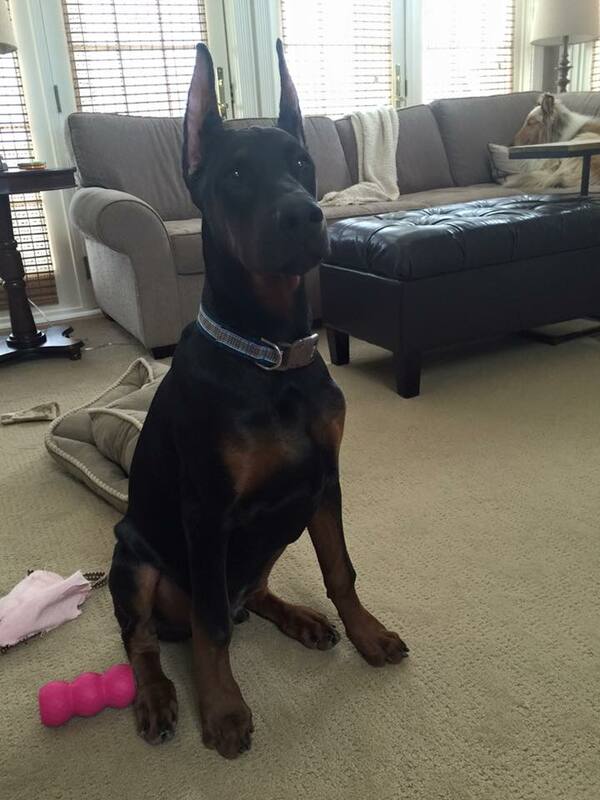 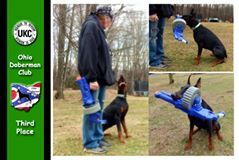 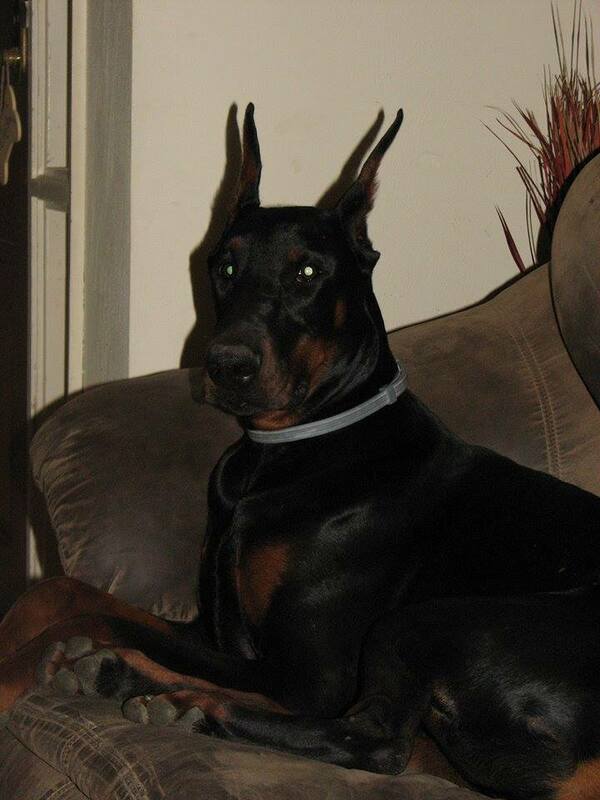 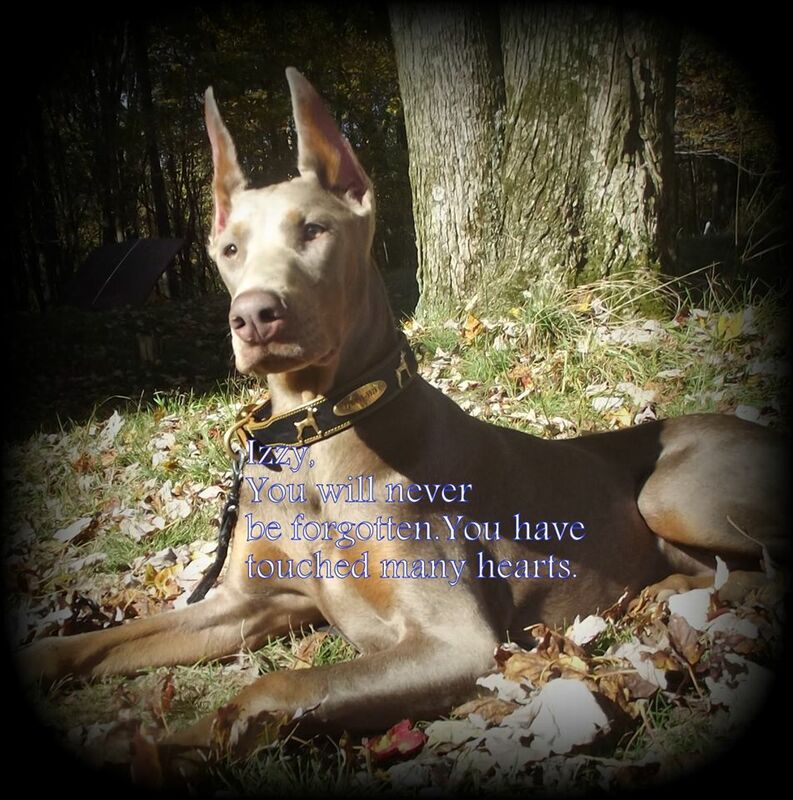 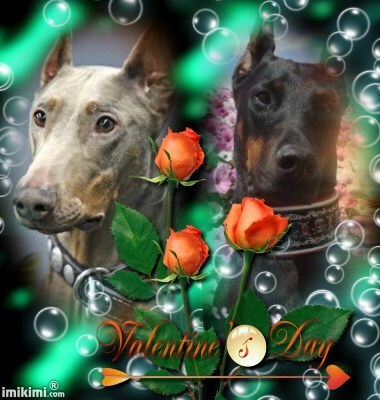 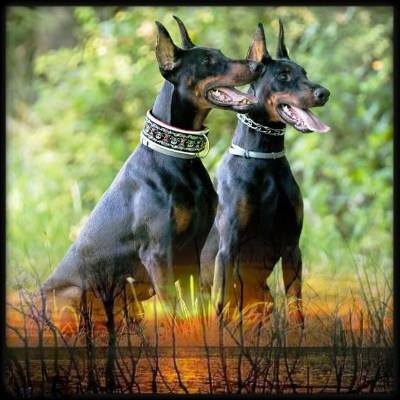 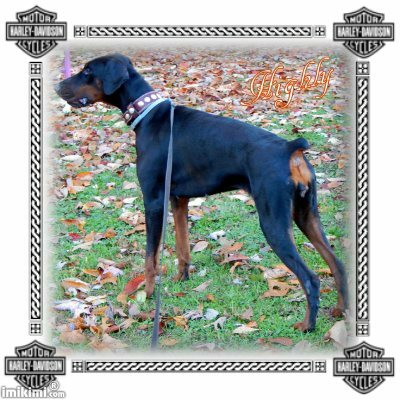 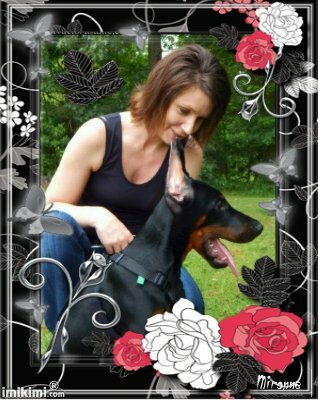 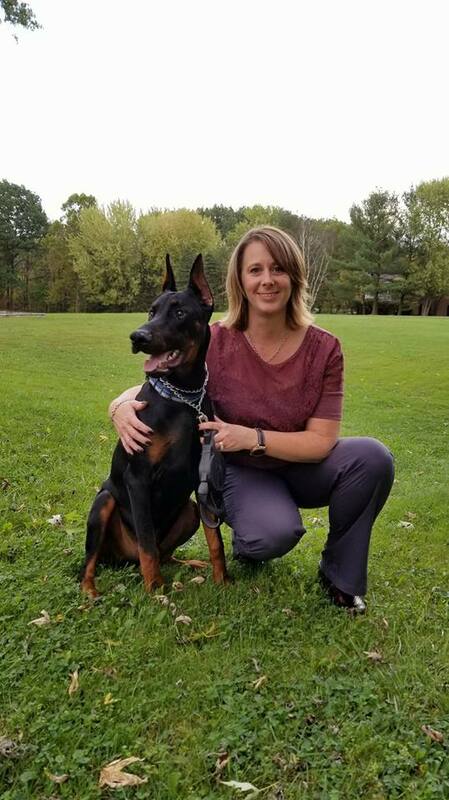 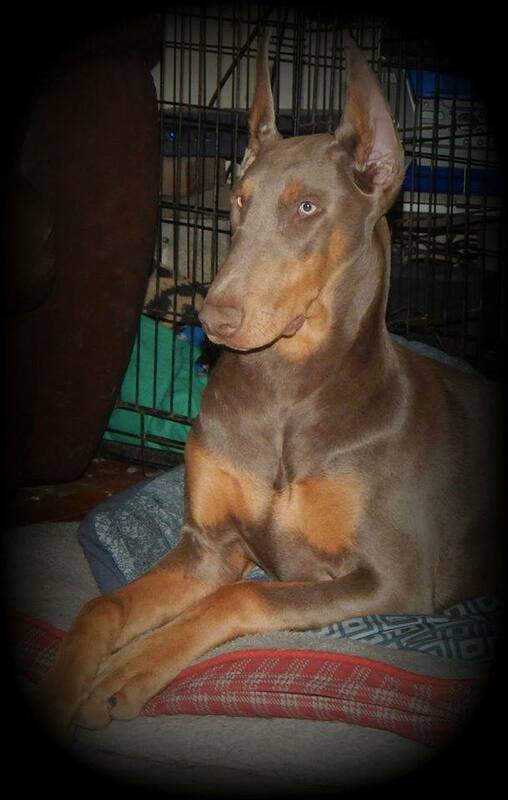 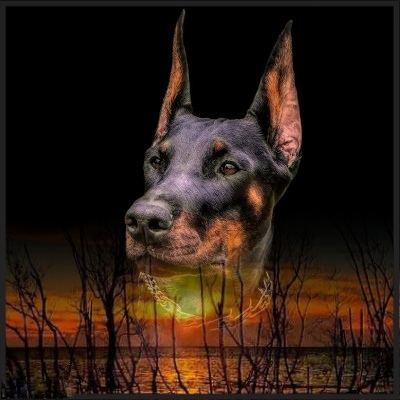 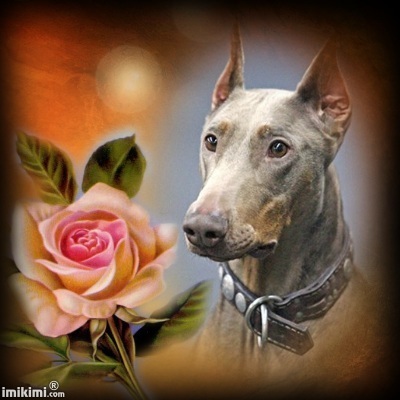 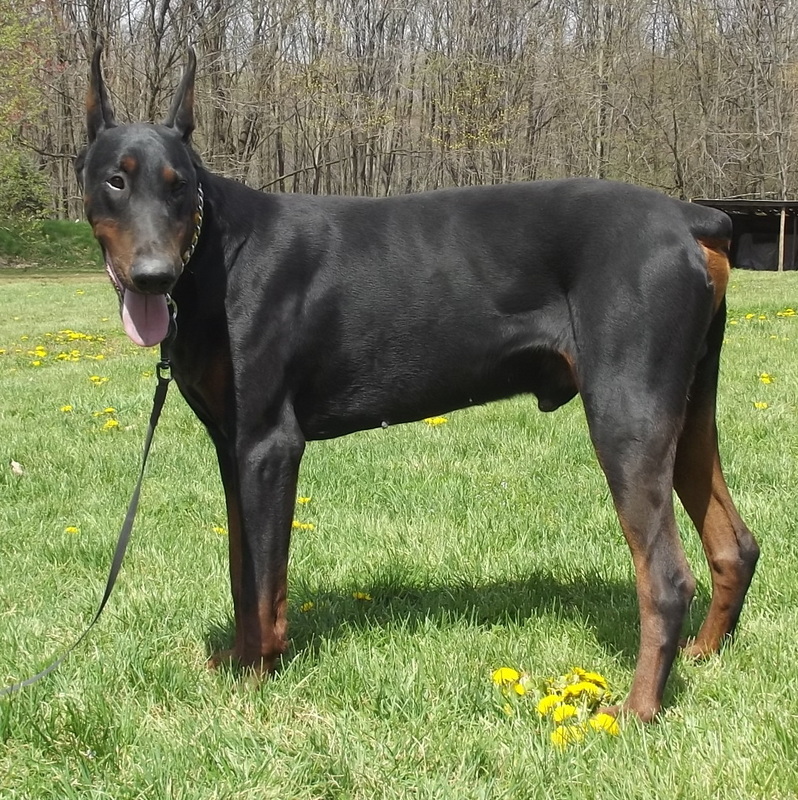 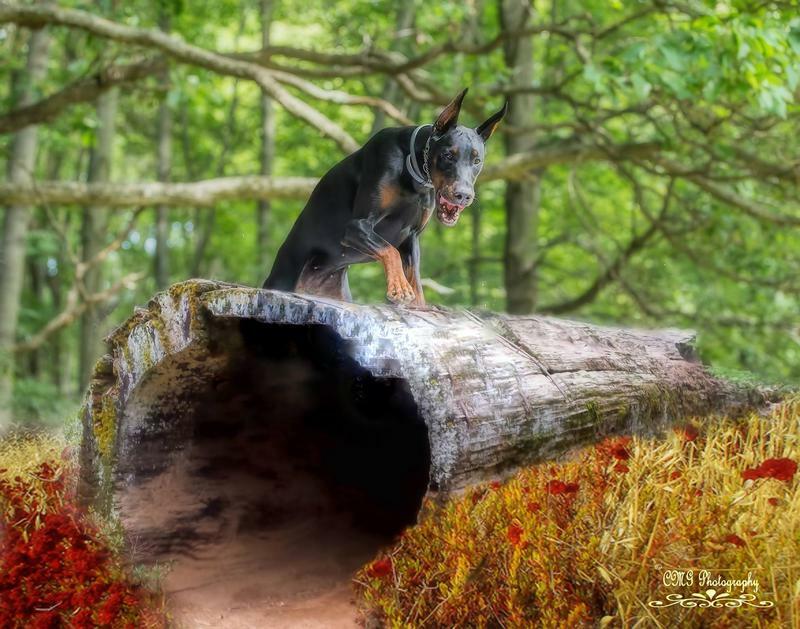 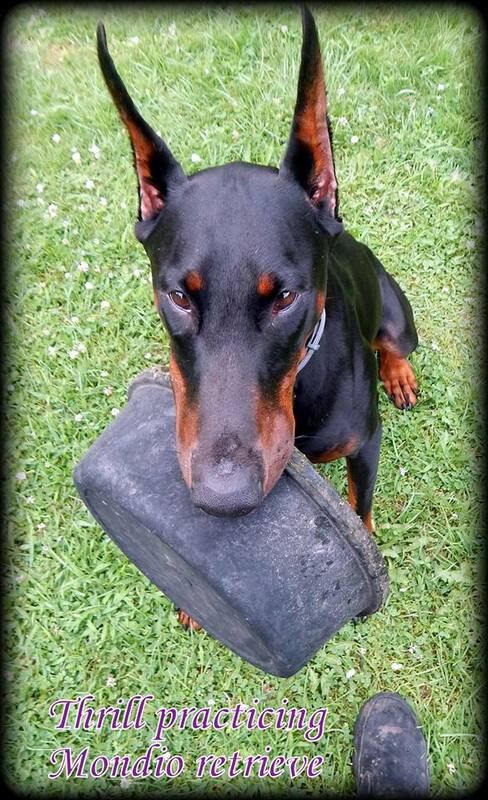 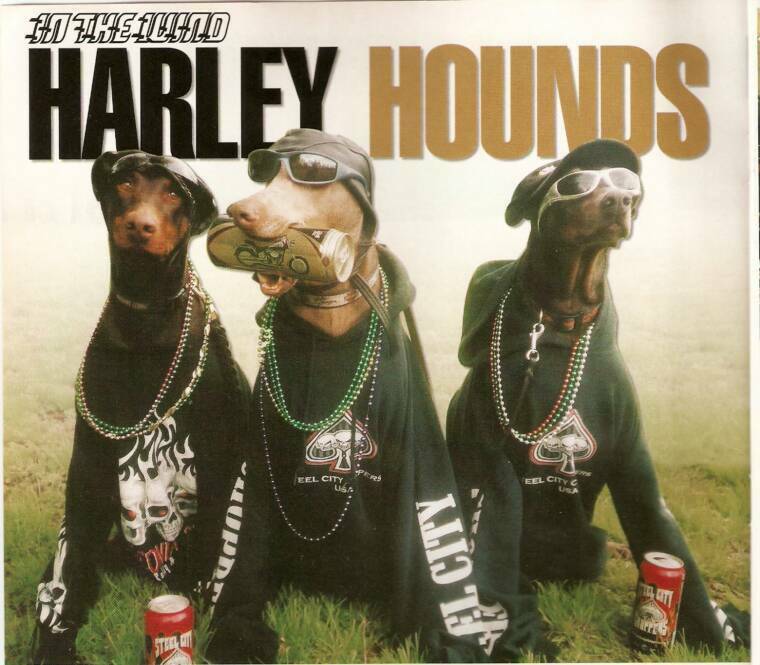 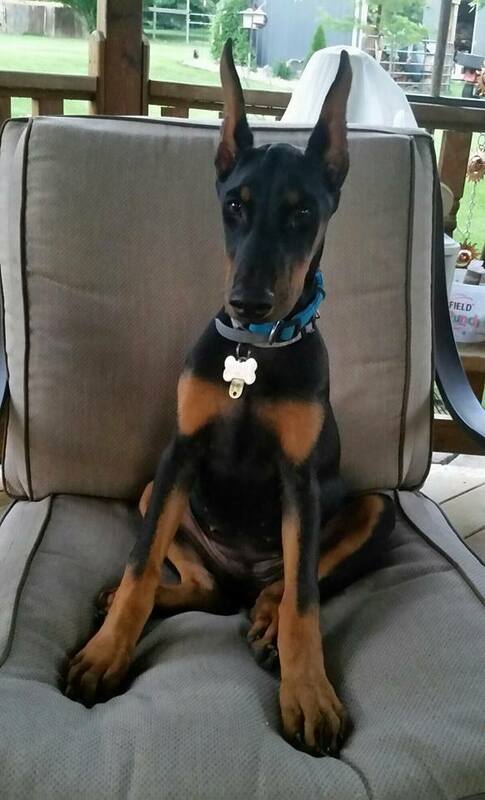 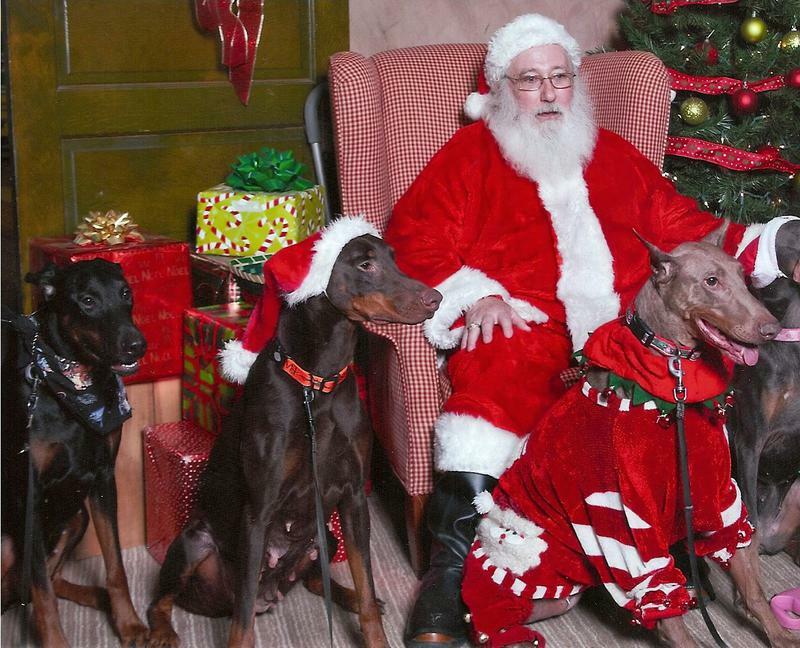 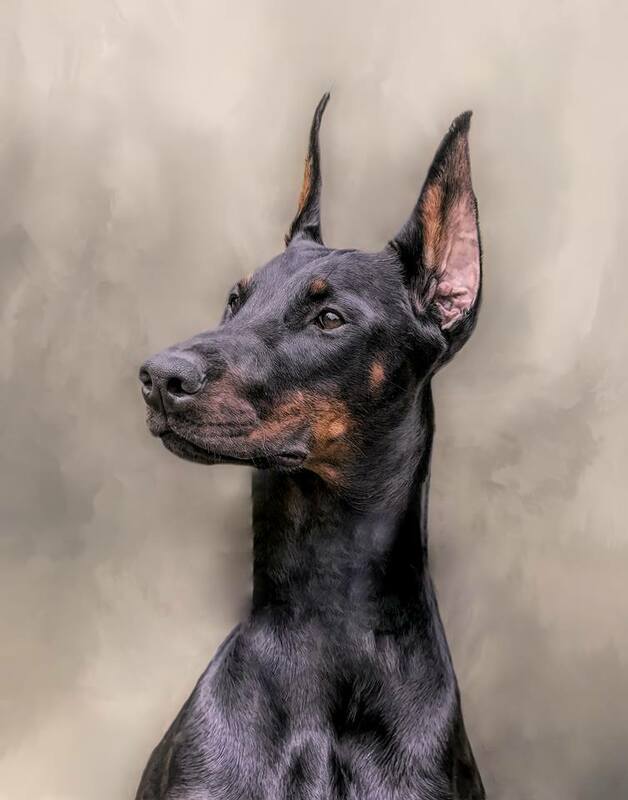 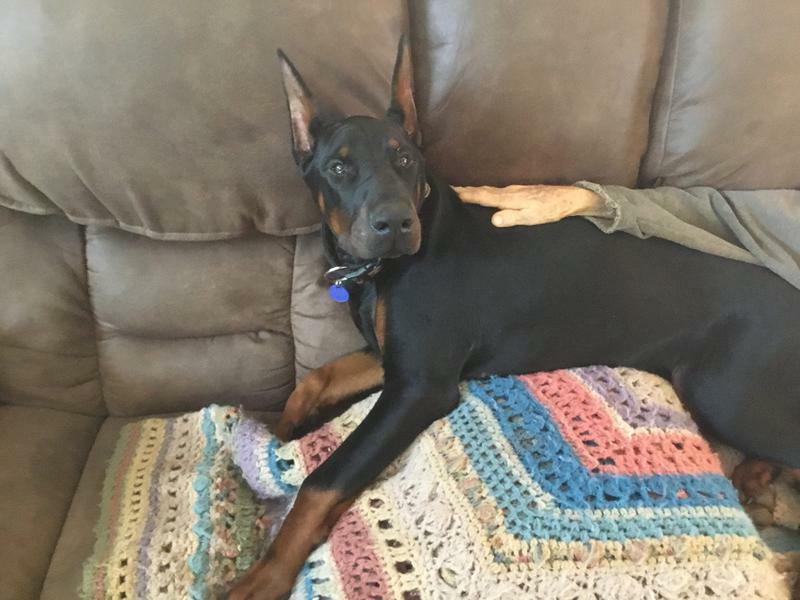 Any use without written permission is strictly prohibited"
Hello , I would like to introduce you to Barnic Dobermans.My name is Barb & I am a Doberman Breeder in PA.I have been breeding and showing Dobermans for 36 years.They are the love of my life. 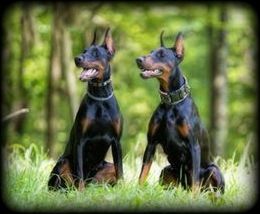 Yes I breed my dogs but I also do a lot with my dogs. 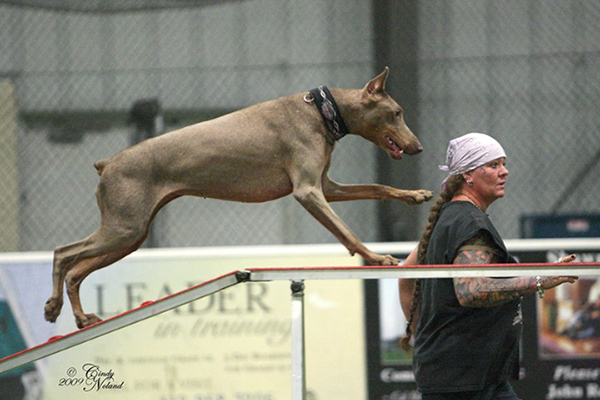 Me & my dogs go to shows almost every weekend.And Training at least 4 days a week.I do not work as this is enough for me to do.I perform with my dogs in Obedience,Rally, Agility & Mondio ring sport . 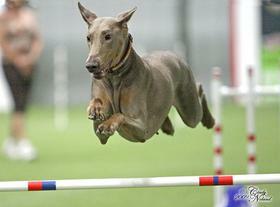 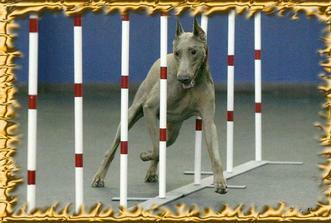 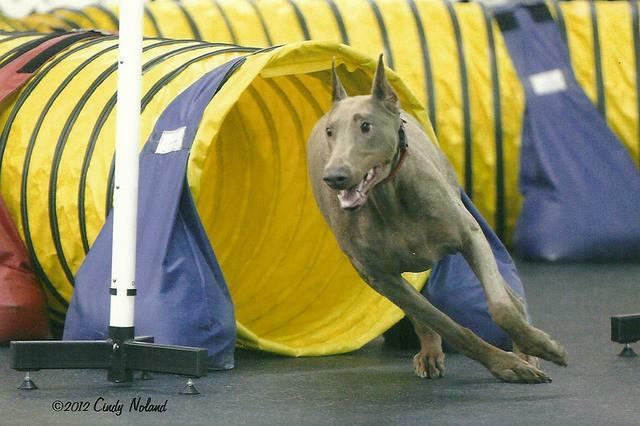 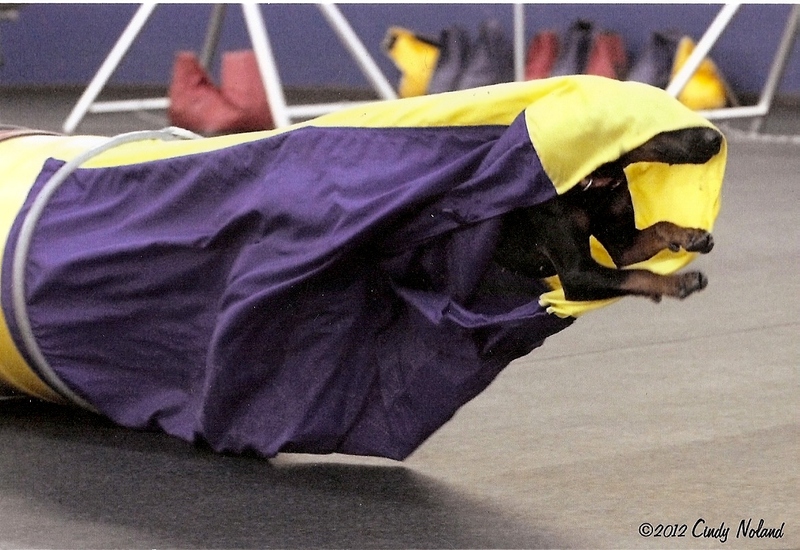 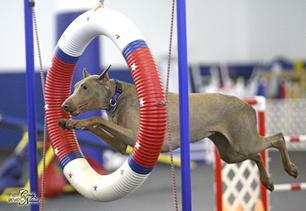 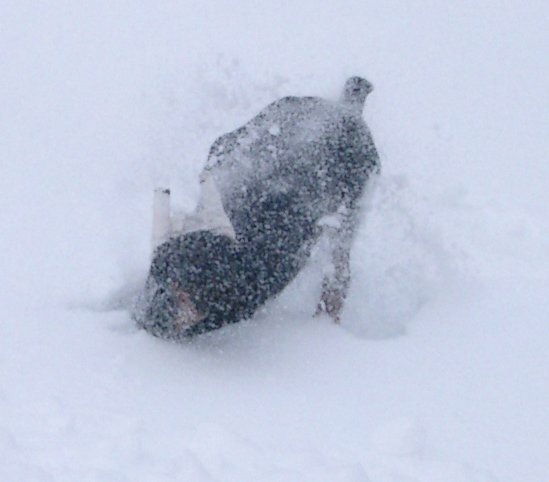 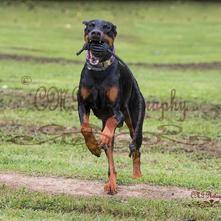 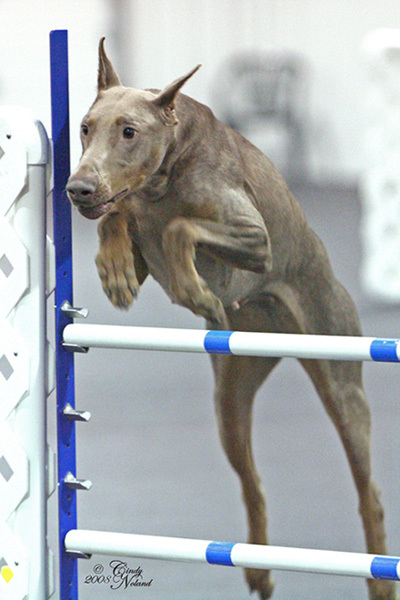 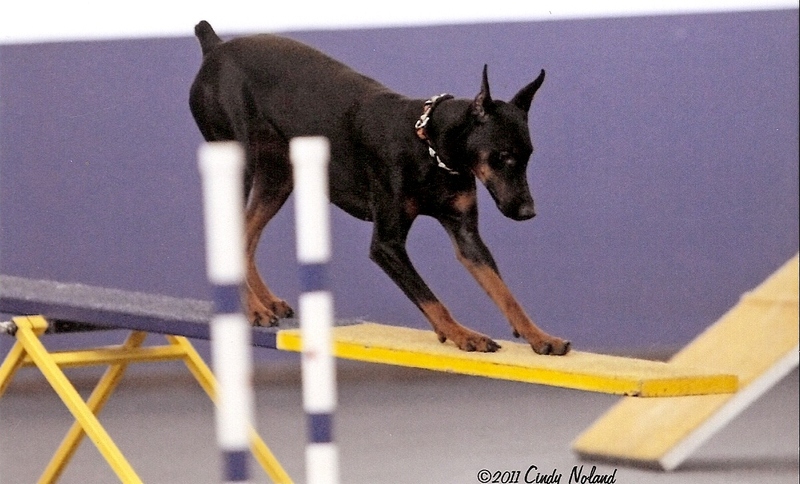 Agility is mine & my dogs favorite sport too.It's lots of fun for me & my dogs. 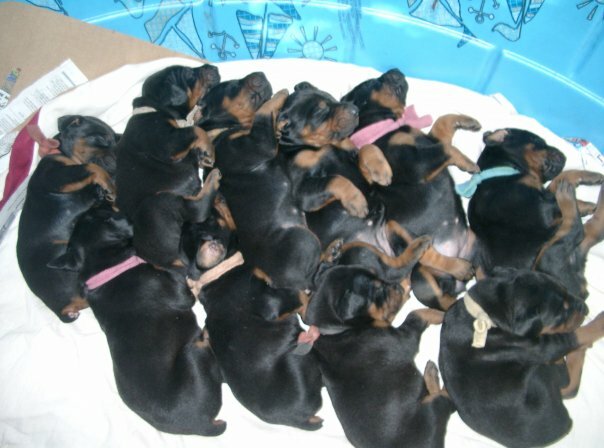 Now let me tell you about the litters I have.All of my puppies are born & raised indoors with lots of love.For those of you that cant come to visit your puppy I try to e-mail pictures so you can see him or her grow as much as possible. 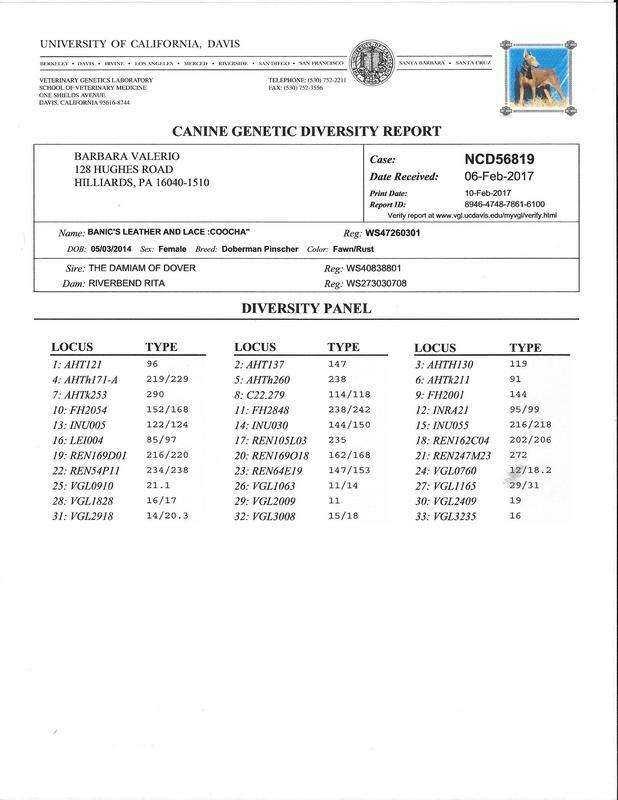 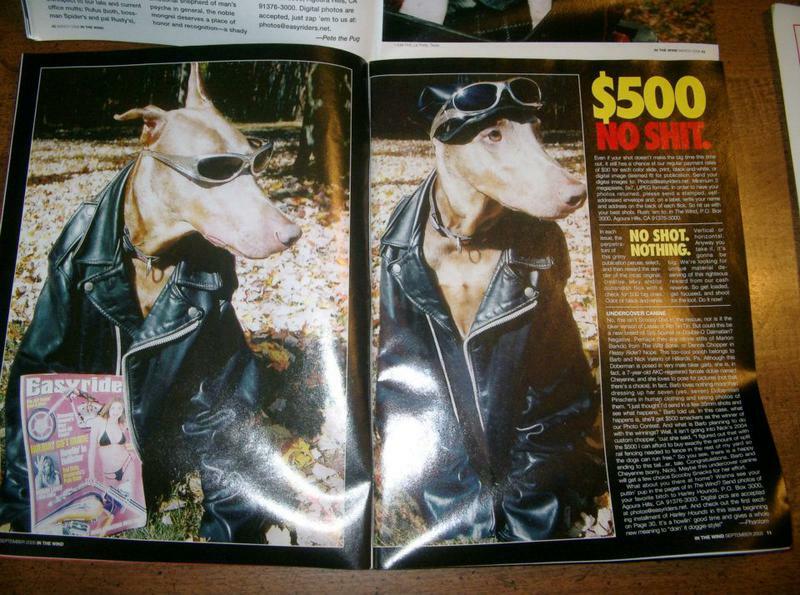 All puppies have AKC papers. 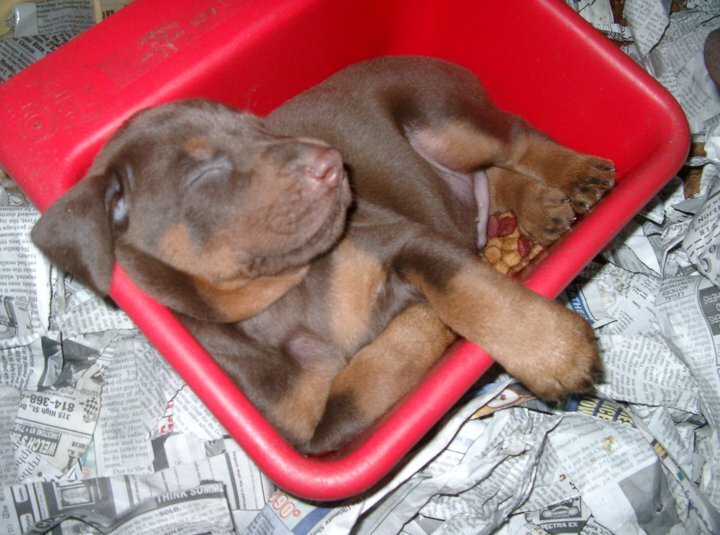 I register all of the puppies for the new owners so you don't have to do it. 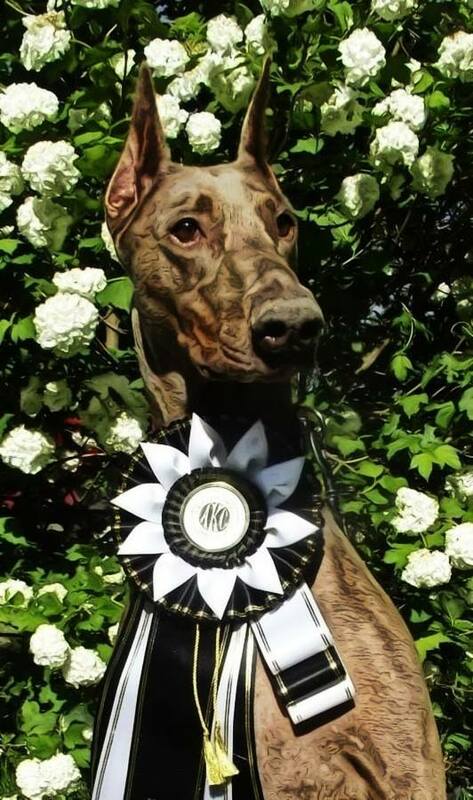 This way i know all of my puppies get registered. 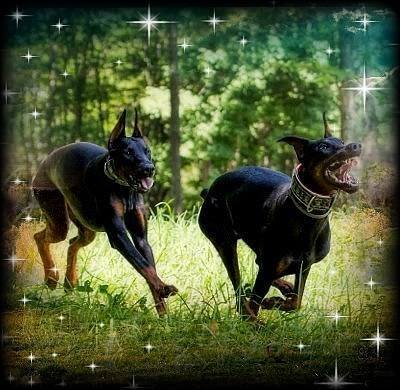 They all come spoiled for you!! 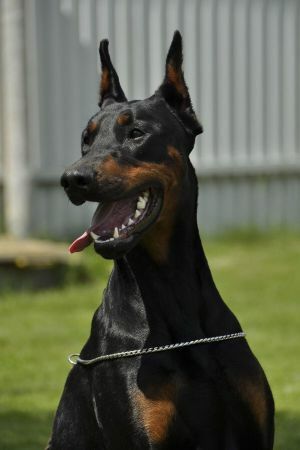 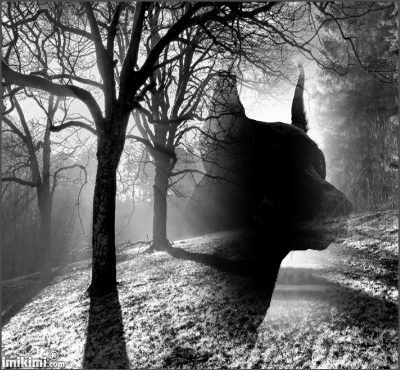 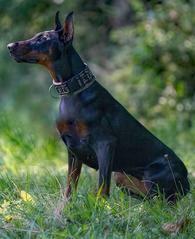 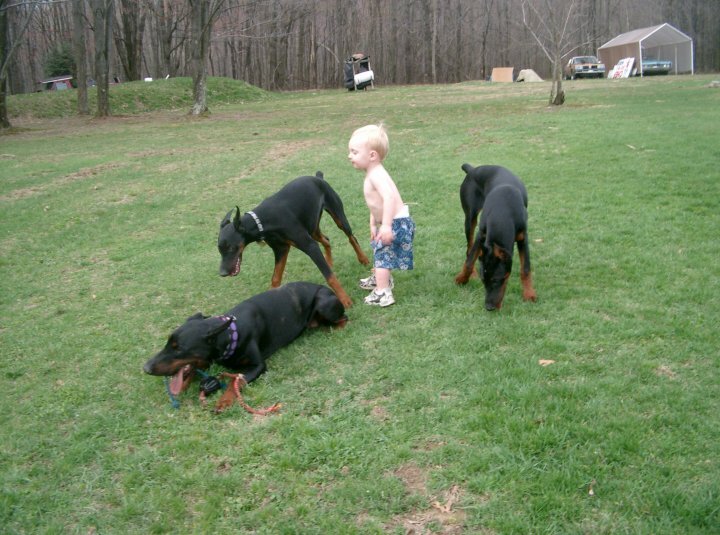 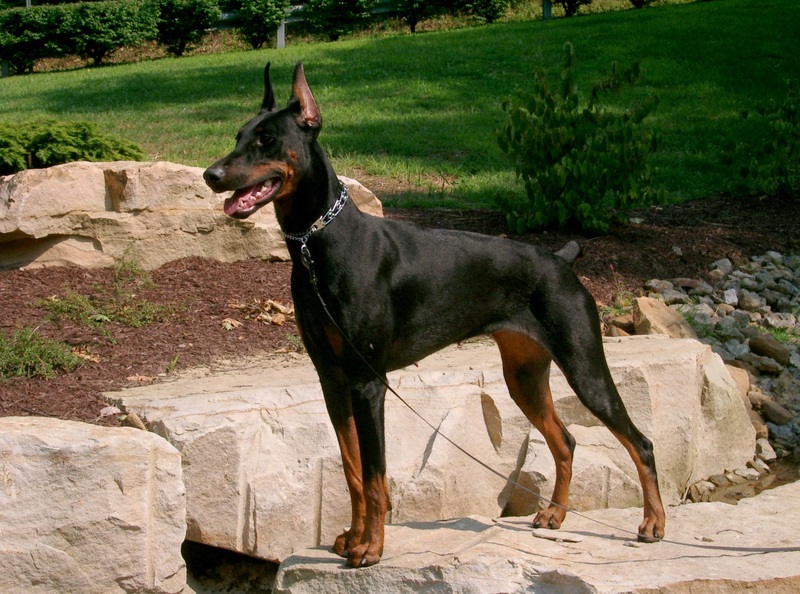 If you are willing to welcome a Doberman into your life,you'll soon have the type of loving,Loyal,well-behaved dog that Doberman Pinscher admirers worldwide rave about.They do require training.So taking one to a puppy class would be good for you to do. 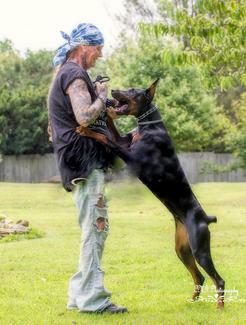 MACH Barnic's Wicked Chopper Dreams. 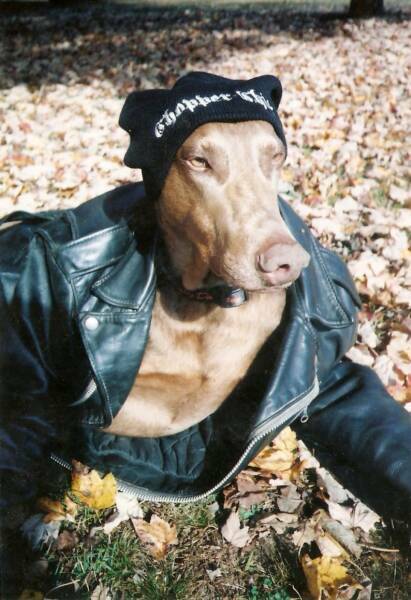 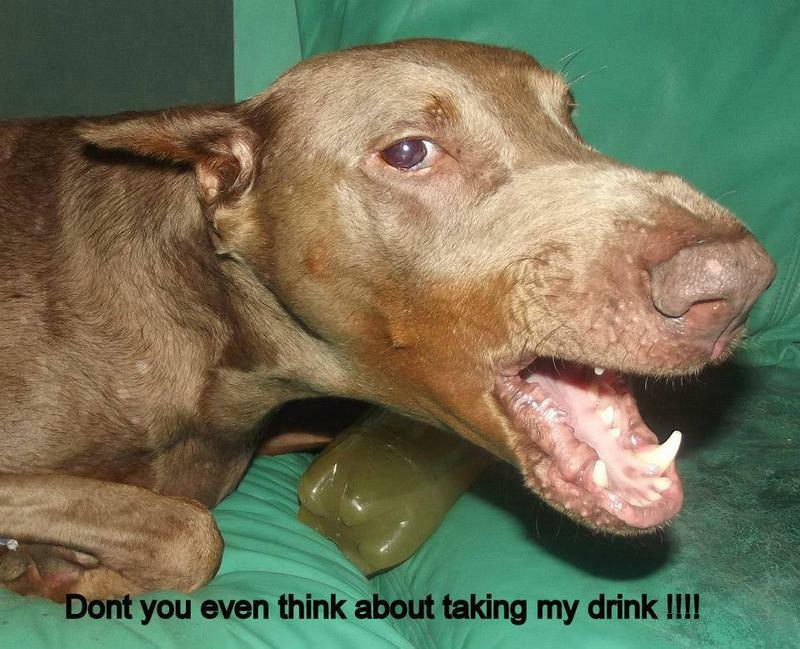 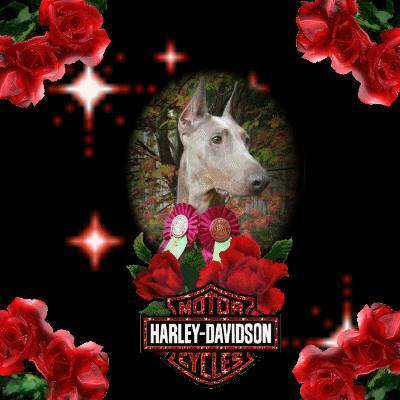 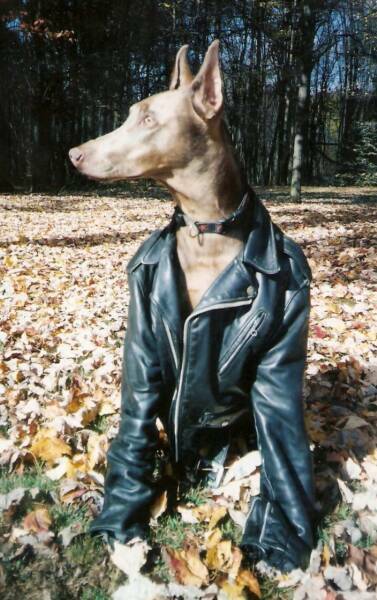 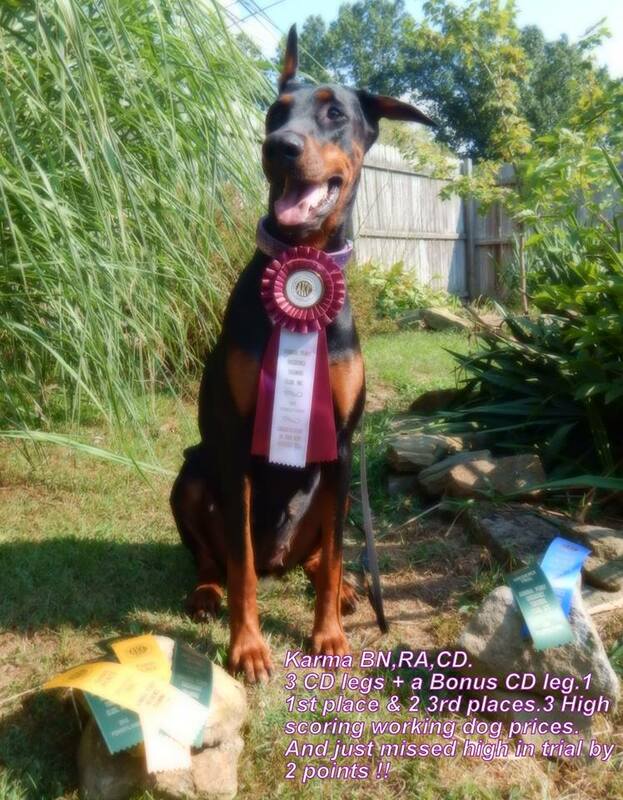 Barnic's Bad to the Bone "Gemma" CDX,MX,MXJ,RE,XF,BN,TT,JS-N ,RS-N,URO-1,CGC. 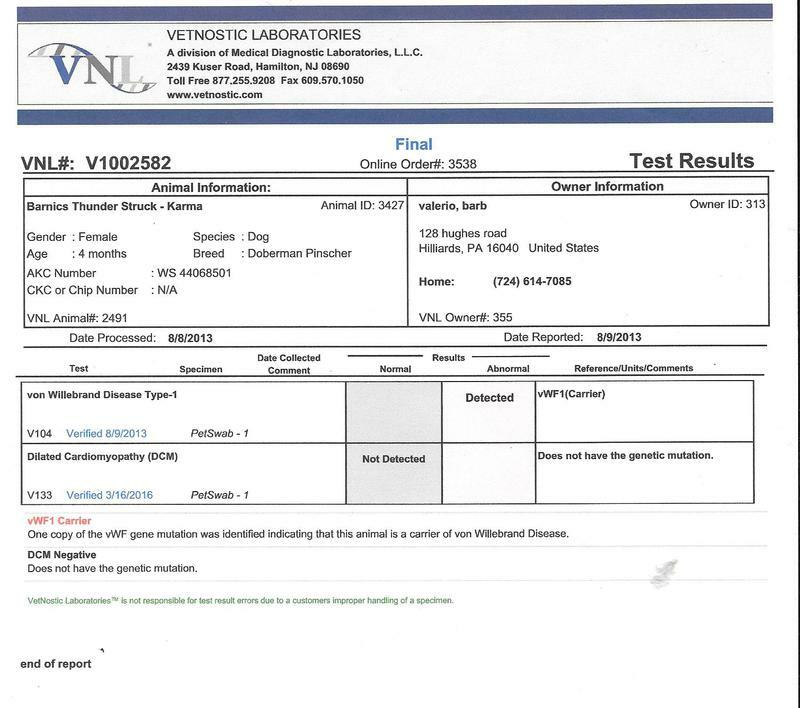 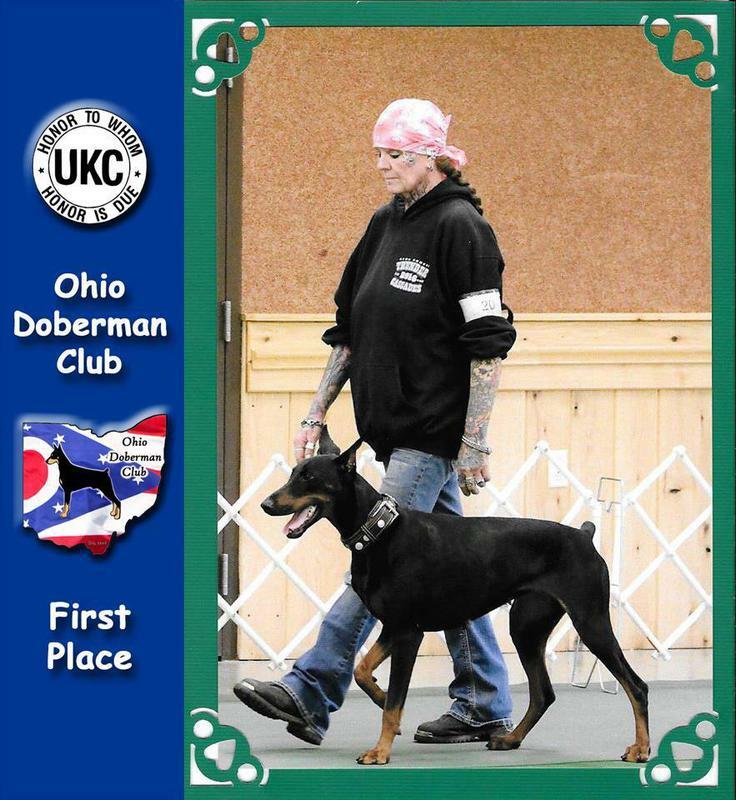 Dob 10/14/09 Retired Due to showing..Fully health test. 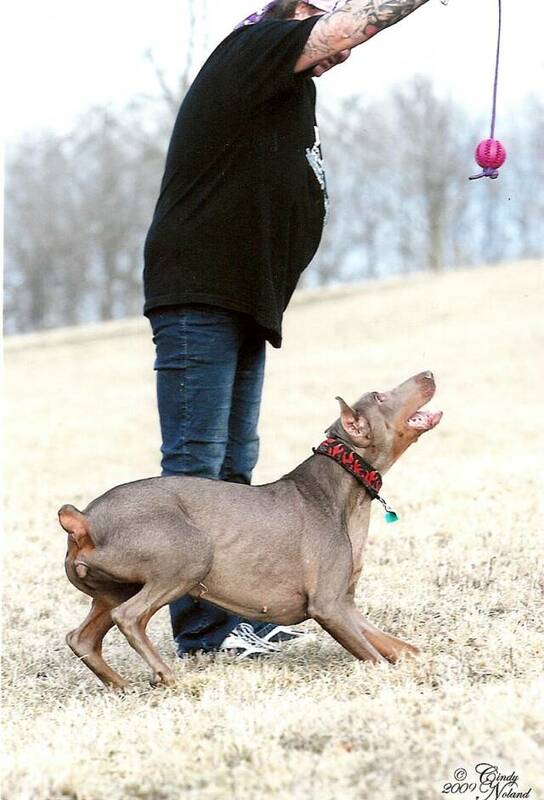 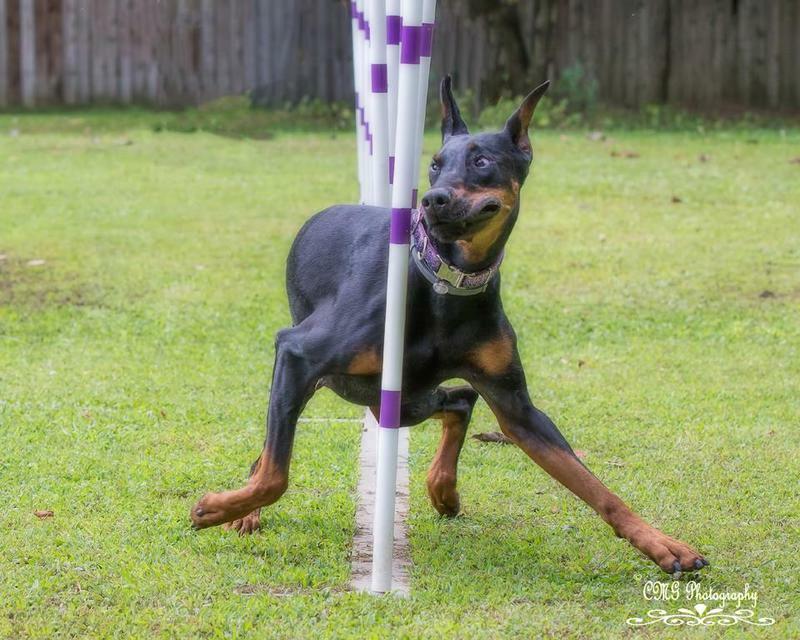 This is my Gemma girl.She is a Taboo/Rigid pup.I have been training her in Ob,Rally & agility.Her favorite thing to do is agility or play a game of ball in the yard.Gemma is now in Masters Agility .She is moving right along ! 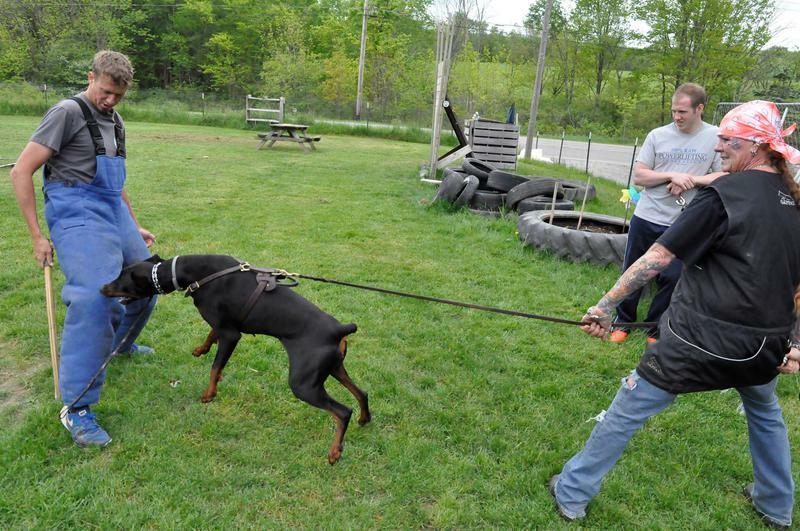 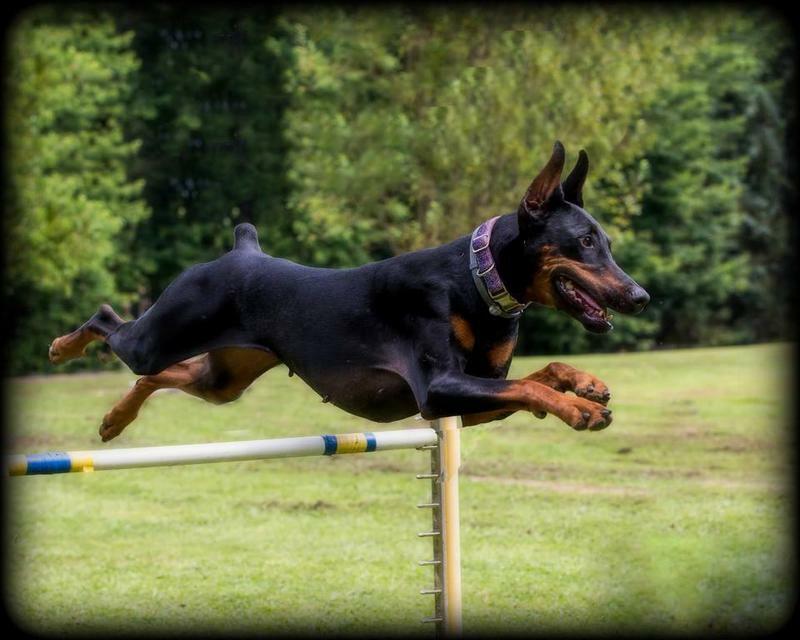 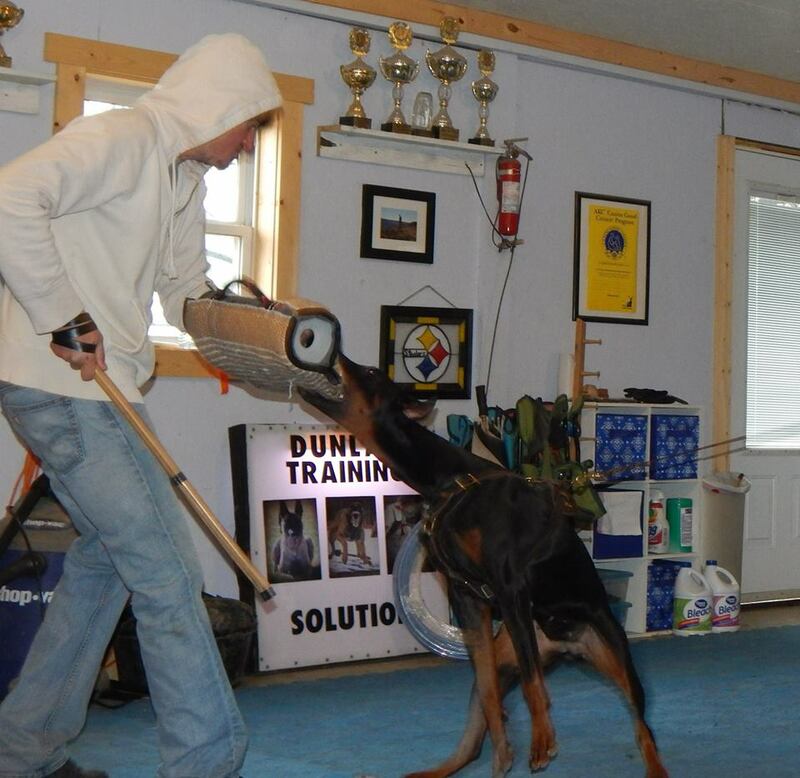 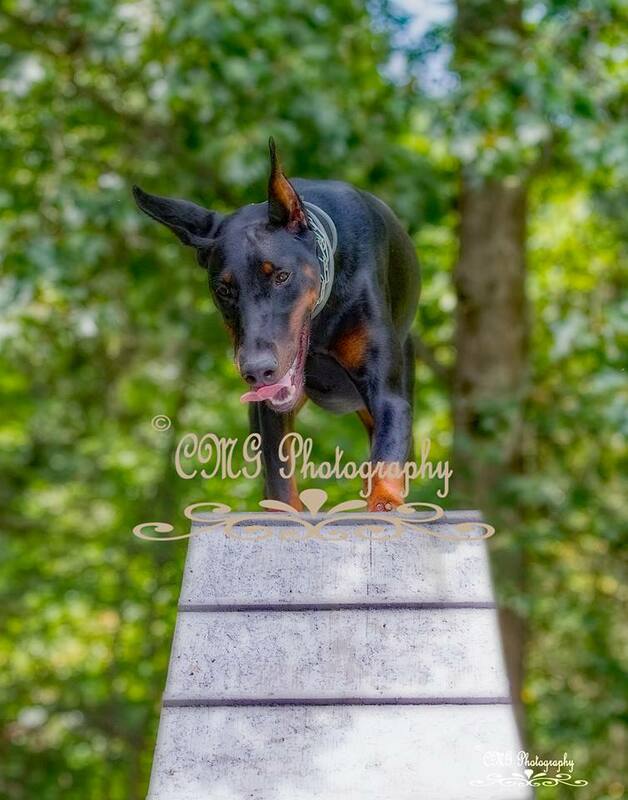 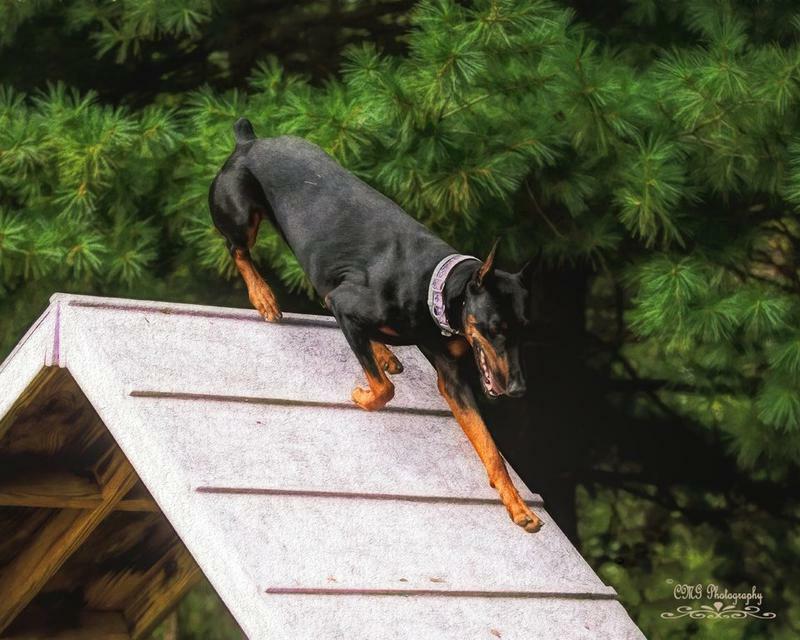 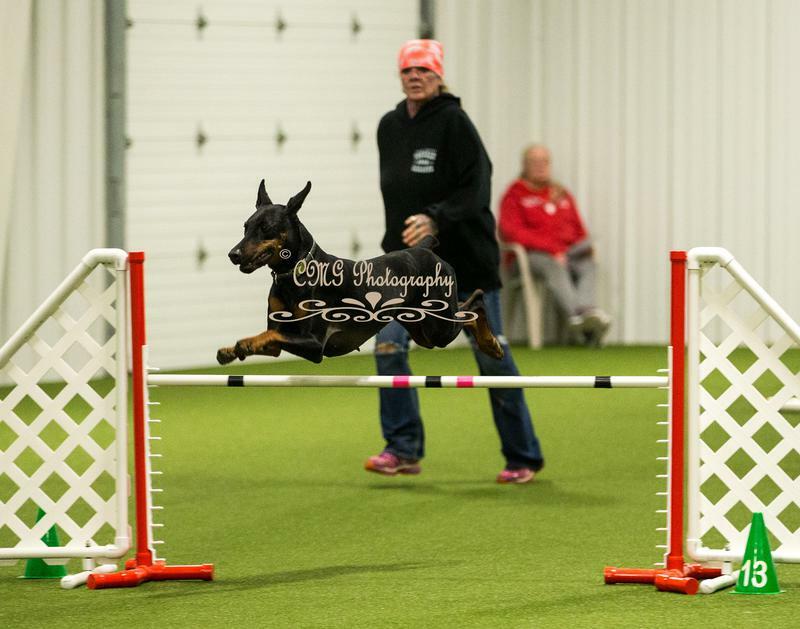 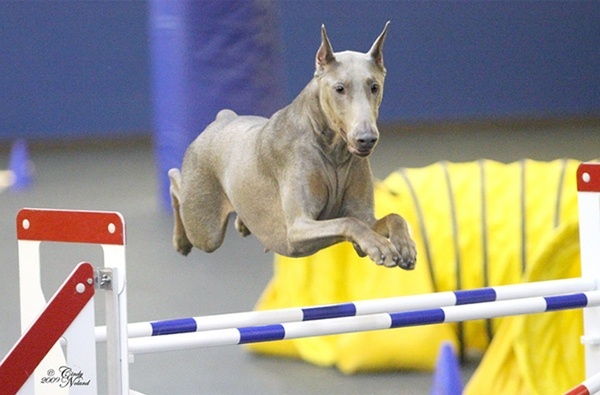 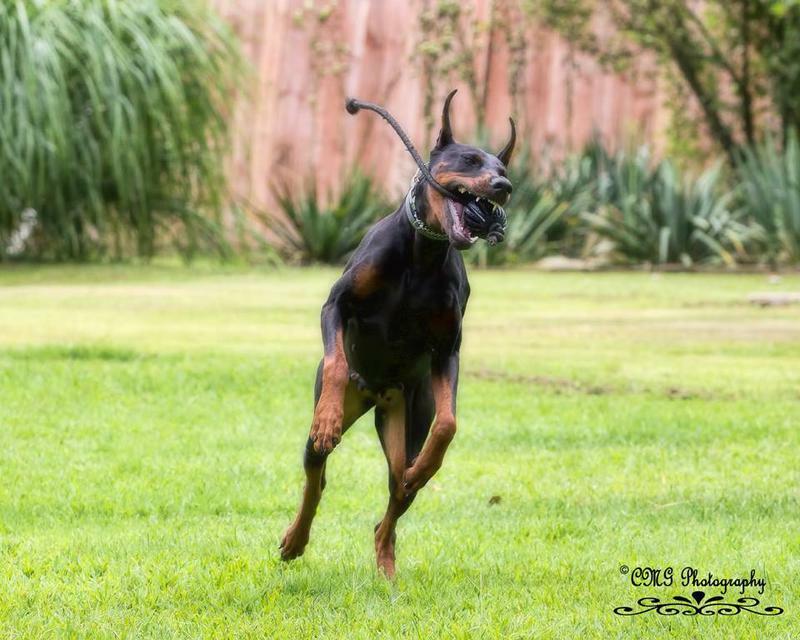 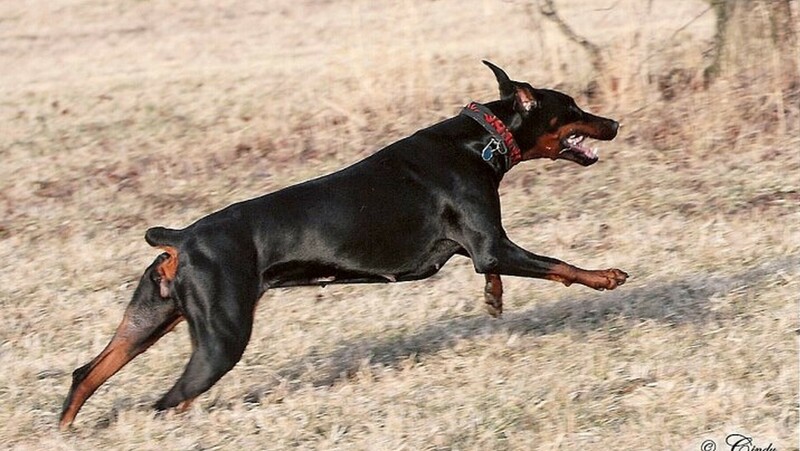 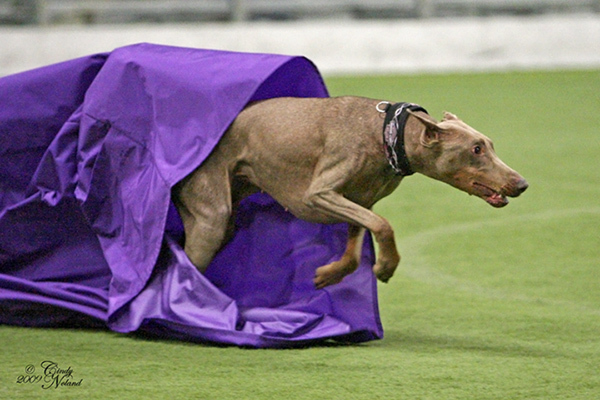 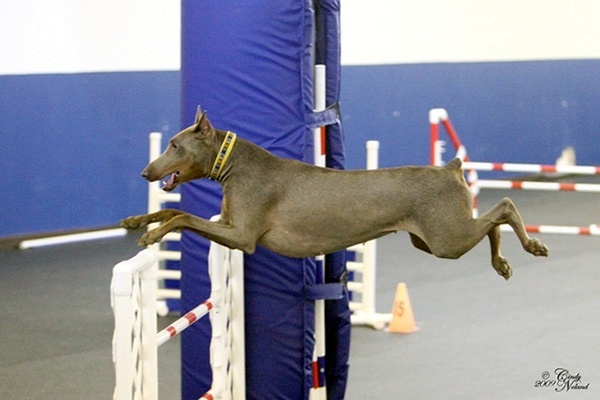 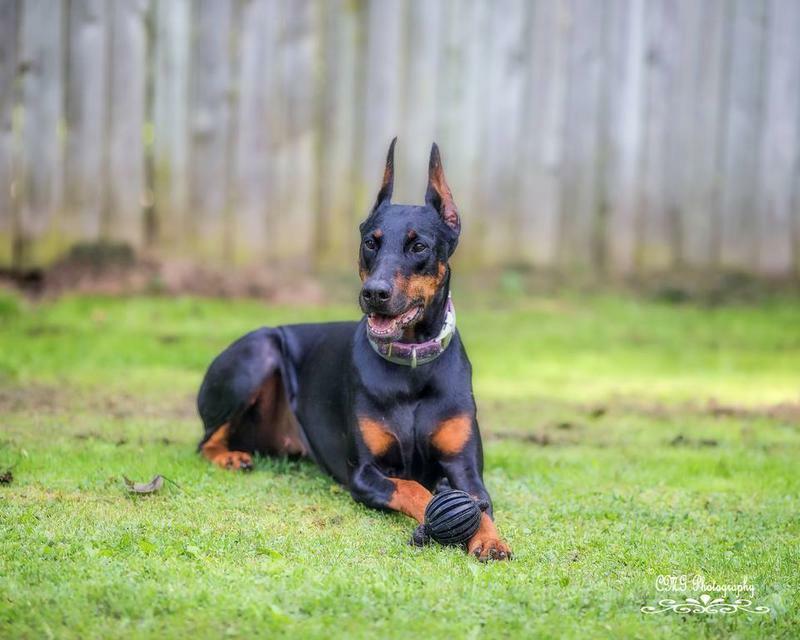 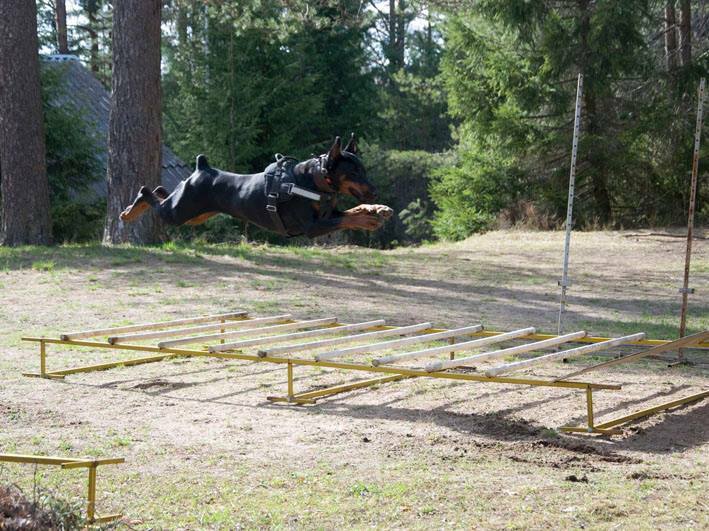 She has alot of drive & is a great working Doberman.Gemma is going for her MACH in agility!She is a joy to work with & a great dog!Gemma has a very high drive!! 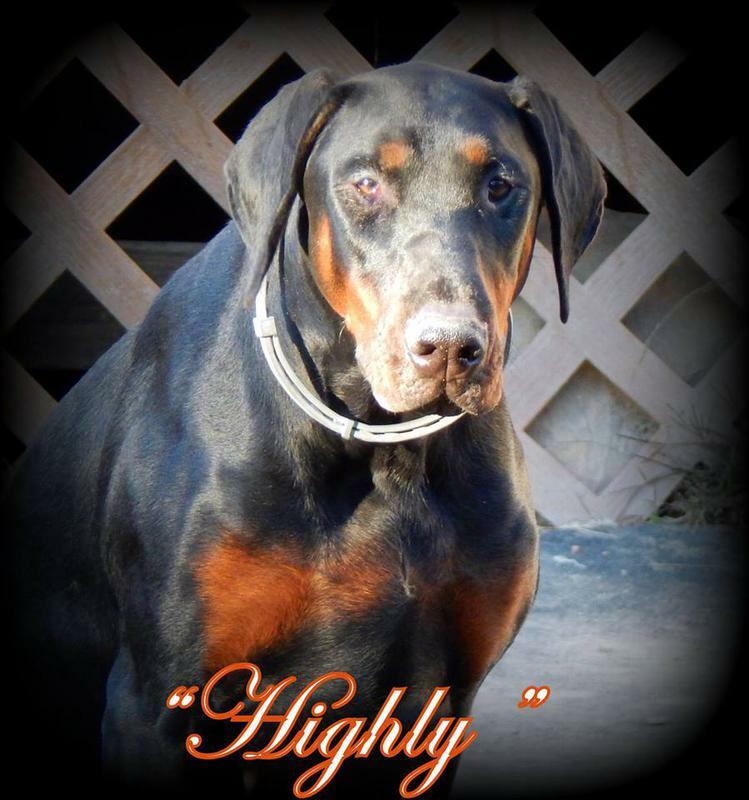 She has a very high ball drive.Eager to please.She has excellent conformation with a very nice top line.Very high up on her feet.She is the Dam to " Thrill"
New litters coming!~ Check puppy available page!! 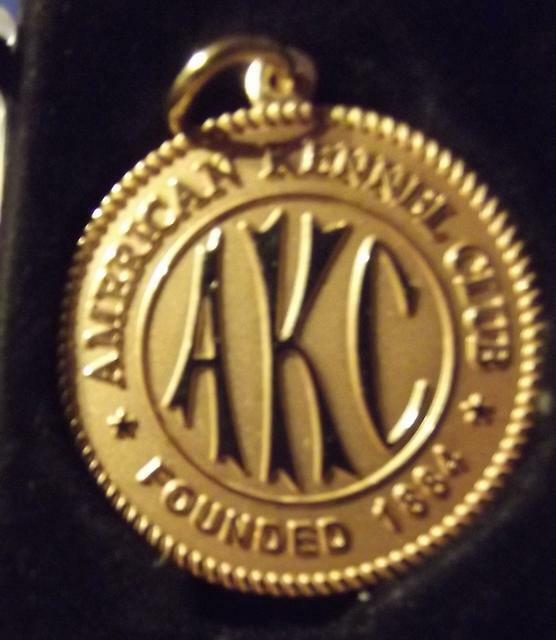 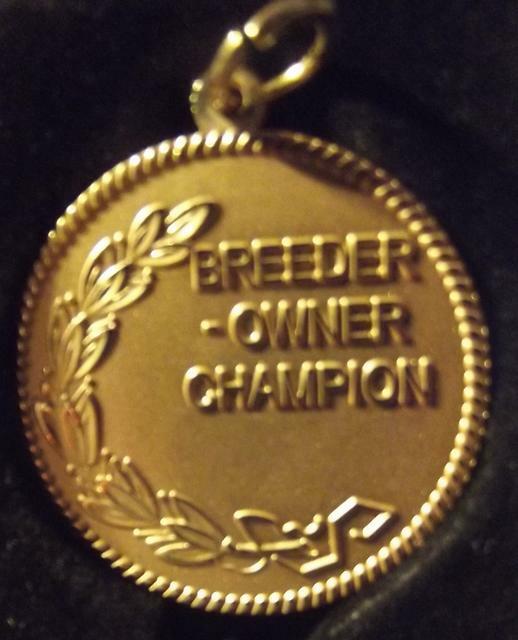 This is what AKC sent me for putting a Championship on Chops! 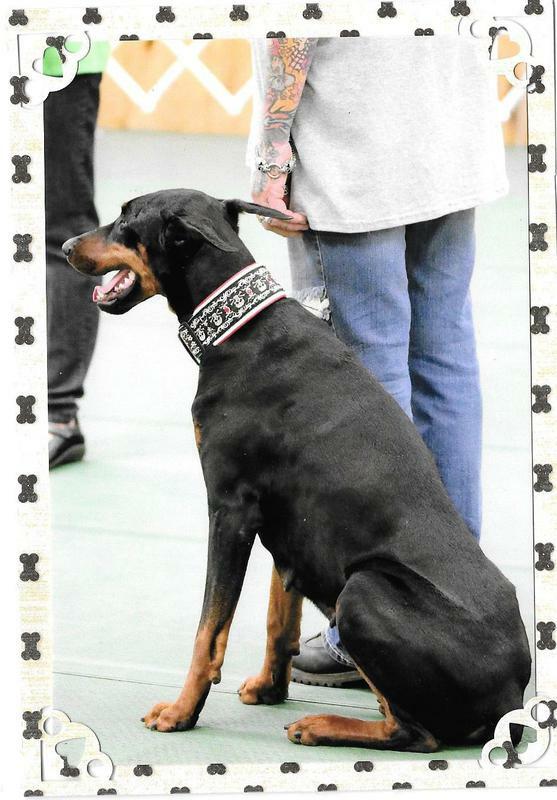 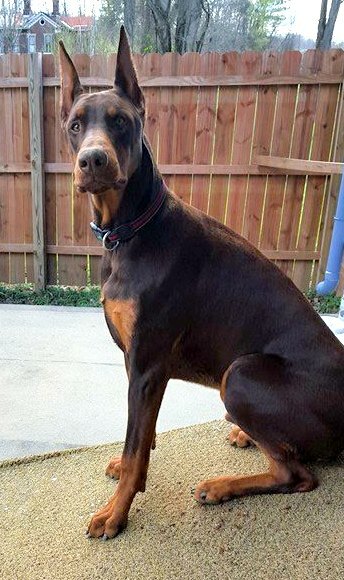 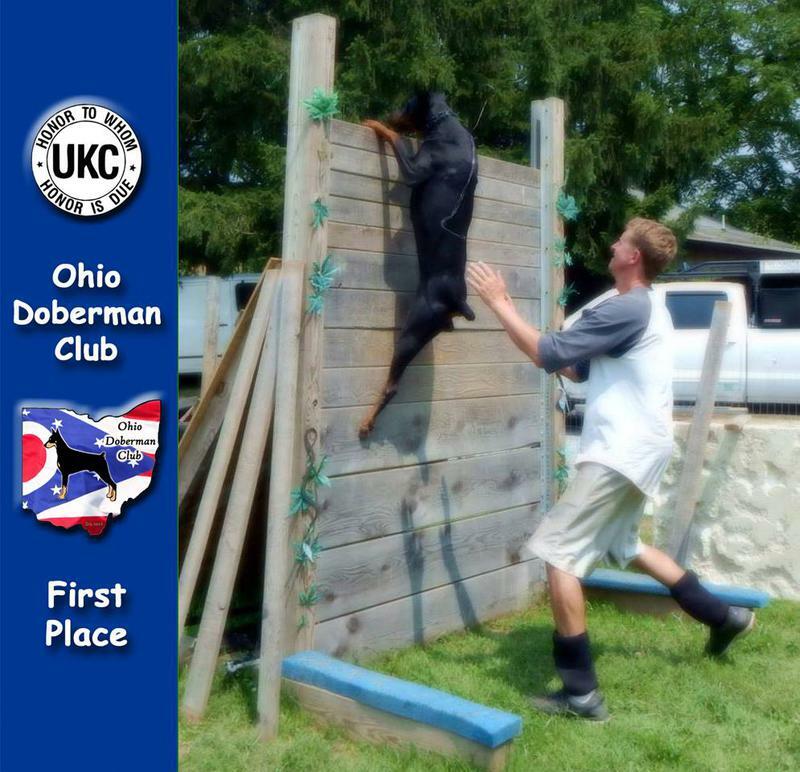 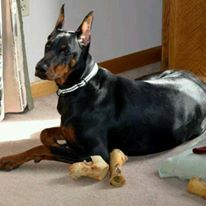 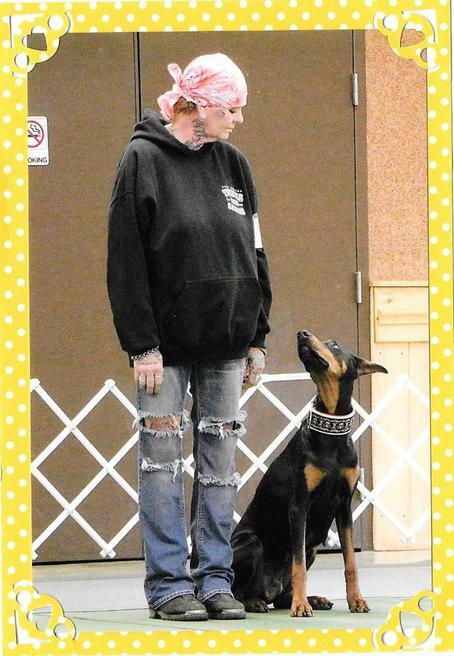 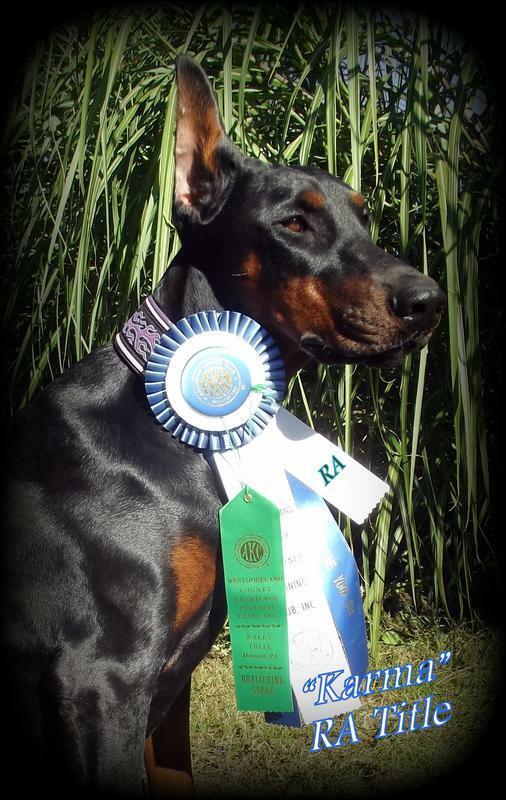 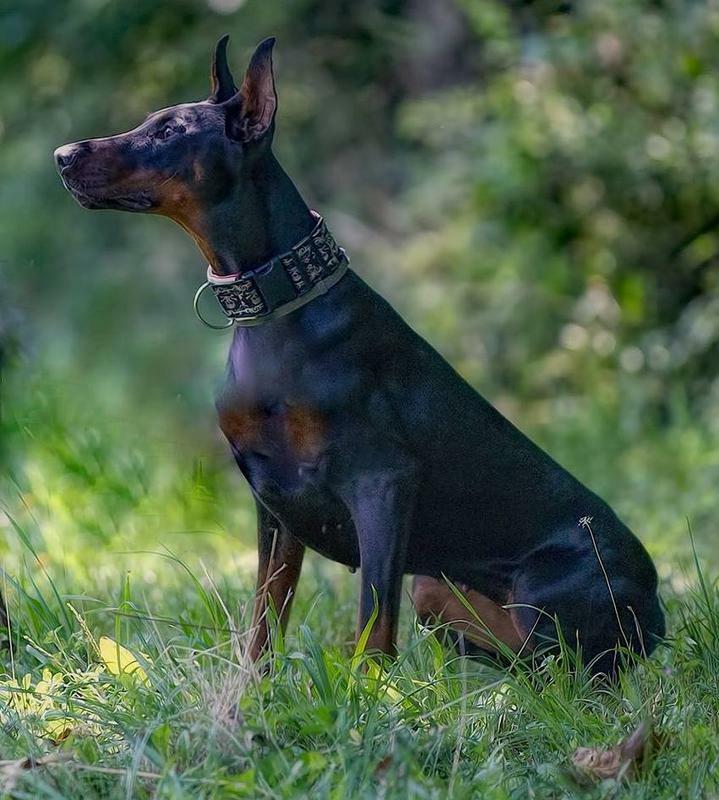 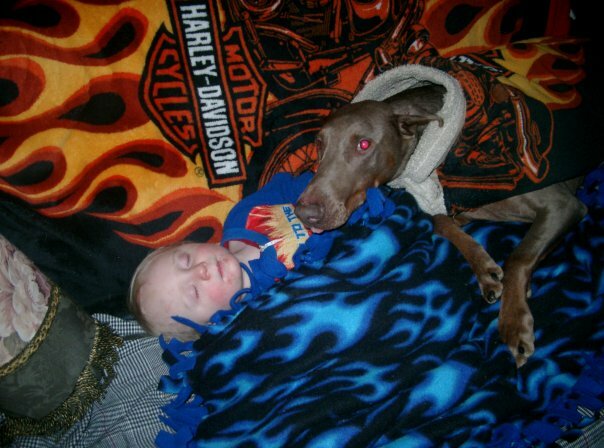 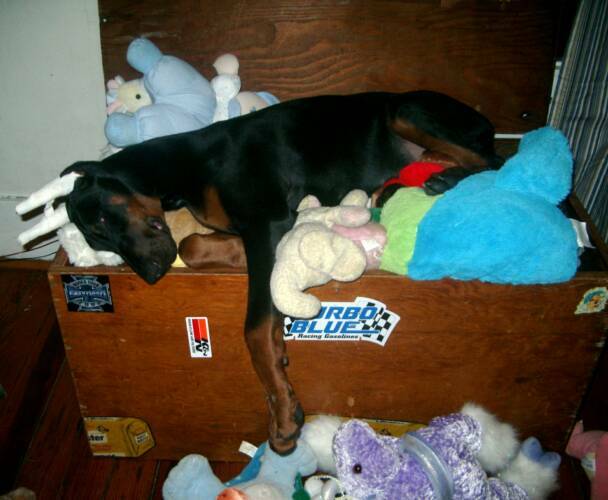 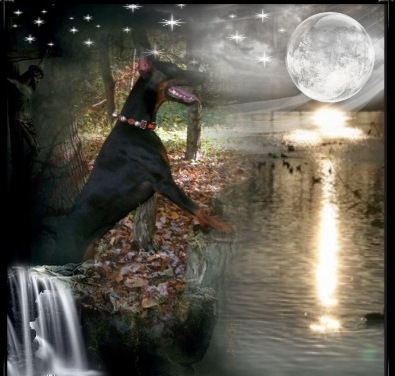 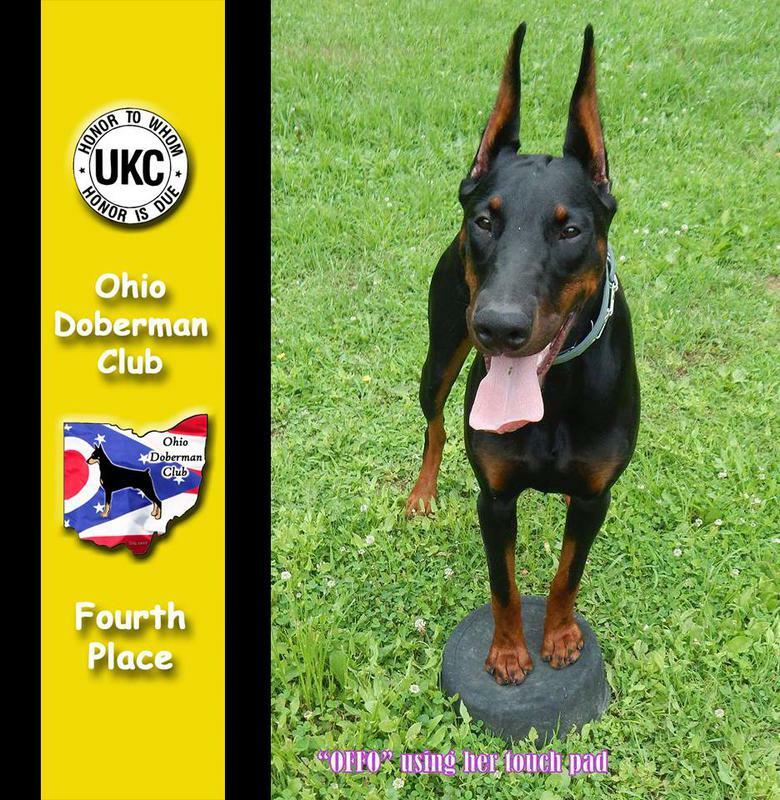 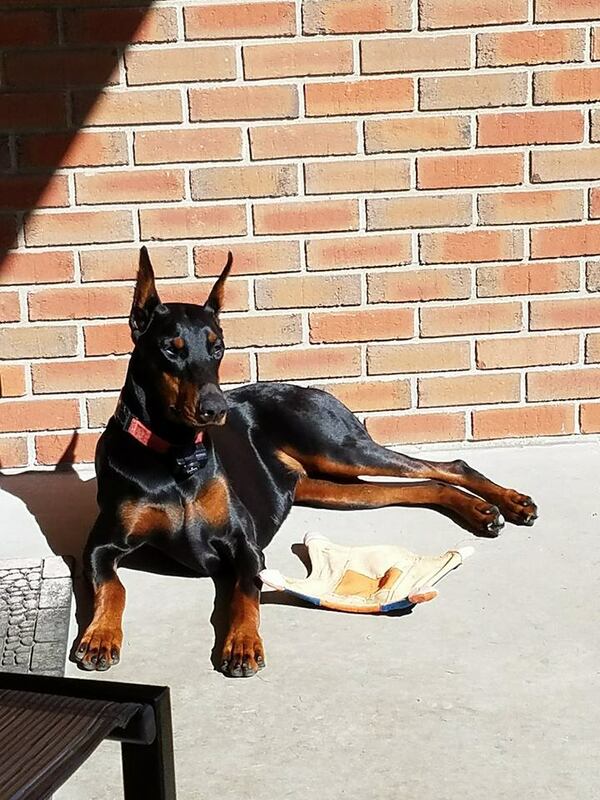 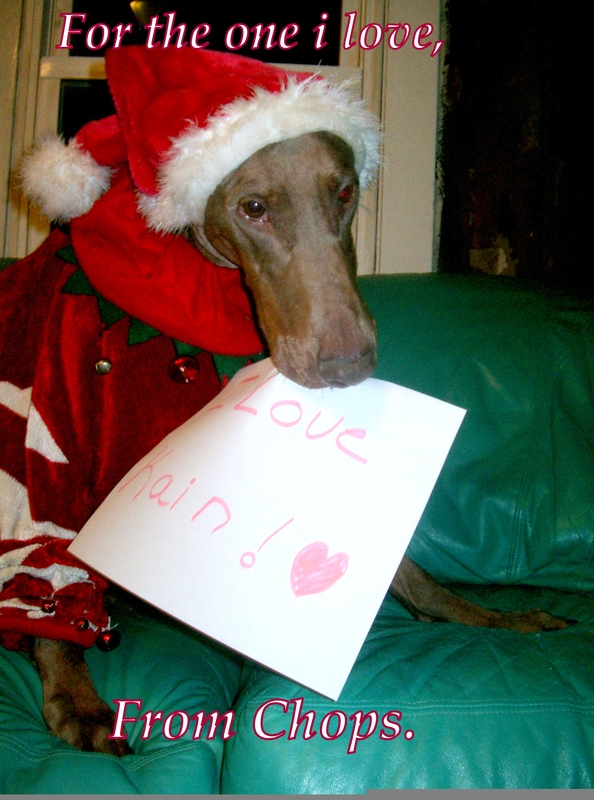 Karma is such a sweet Doberman.I am training her in Ob & Rally.She shows in Events in AKC,UKC, ASCA,CPE.She has a very stable temperament.Gets along with other dogs and other pets.She loves people. 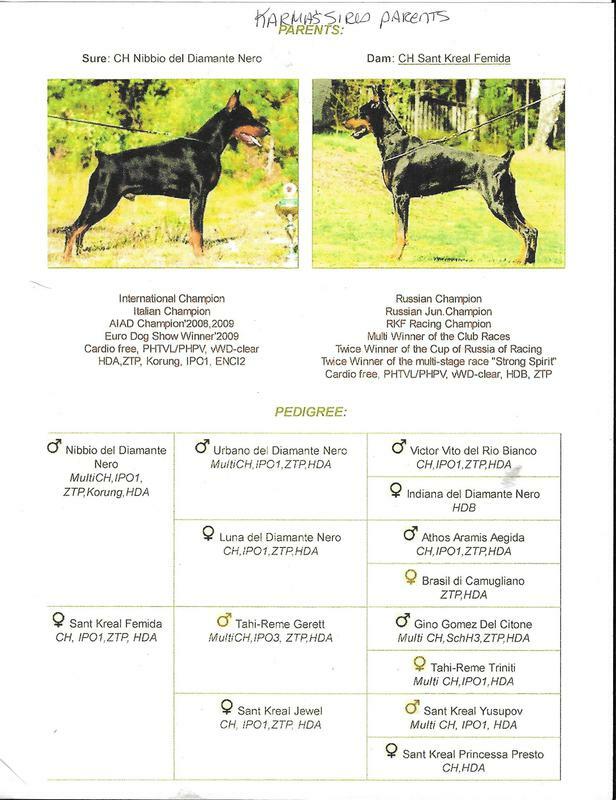 Very willing to work .Karma is now going for her CDX She only needs 2 legs .She is out of Evo and a Russian Import ~Sant Kreal Umberto.Her Grandsire is CH.Nibbio Del Diamante Nero .He has numerous working titles and Championships.Her Grandam is CH.Sant Kreal Femida.She also has numerous working titles and Championships.She is also a Champion Racing sled dog in Russia! 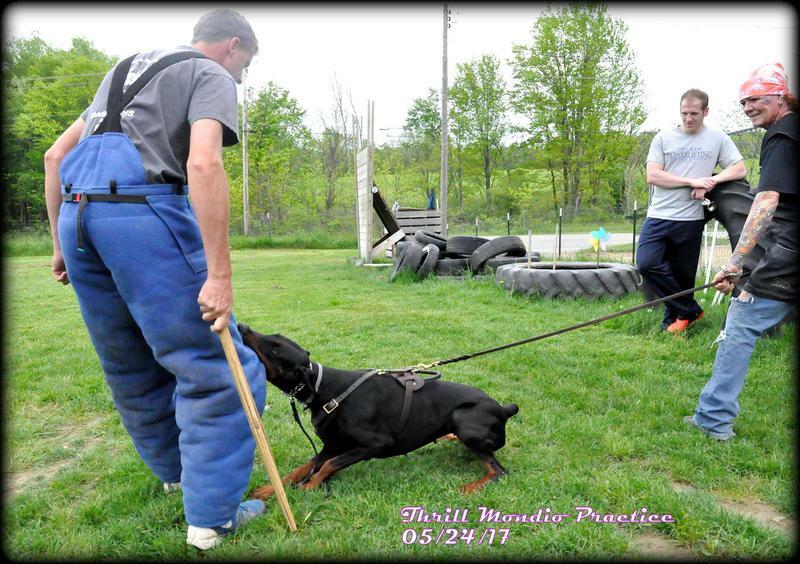 karma produces wonderful working pups.Karma is high scoring in the ring. 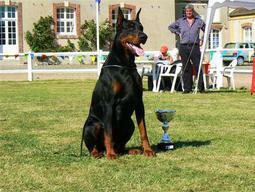 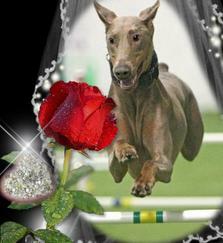 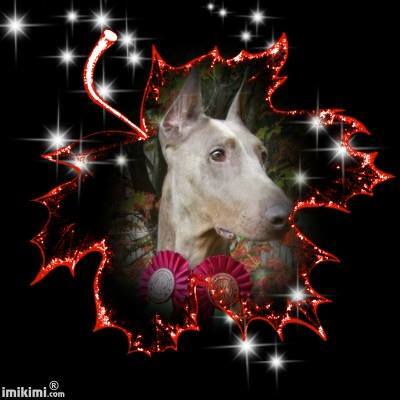 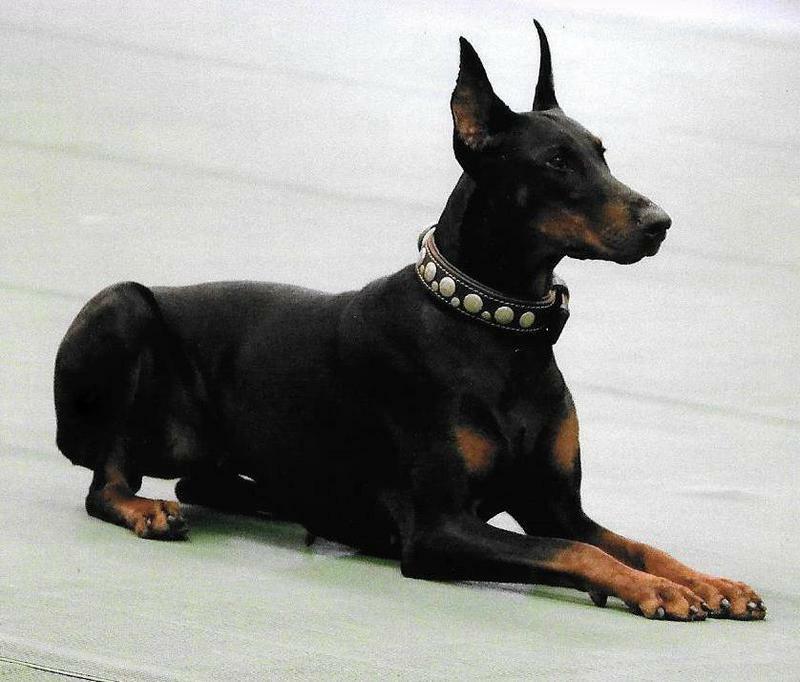 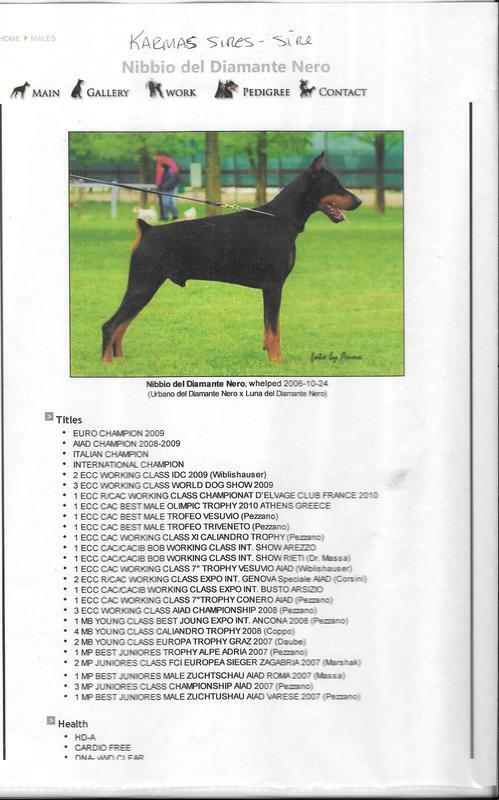 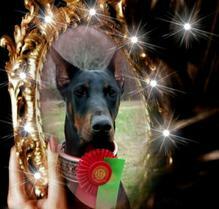 Nibbio del Diamante, NeroInternation Ch.Italian Ch. 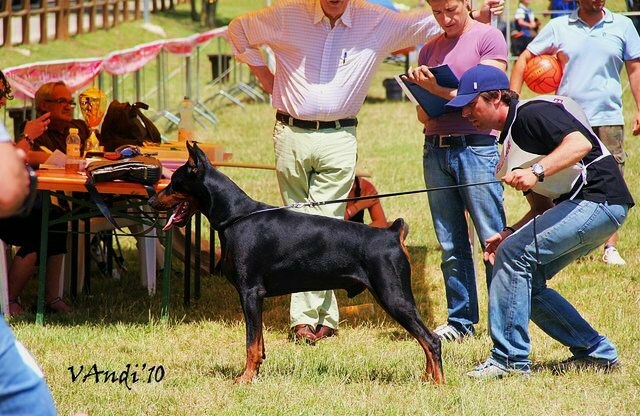 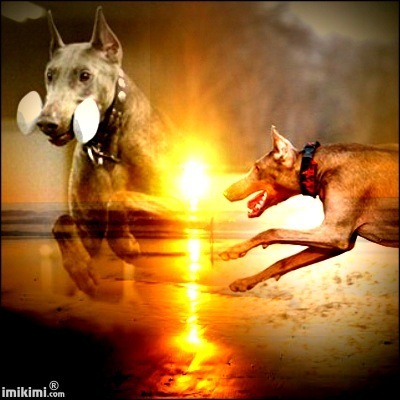 Russian Ch.Russian Jun.Ch,RKF Racing Ch. 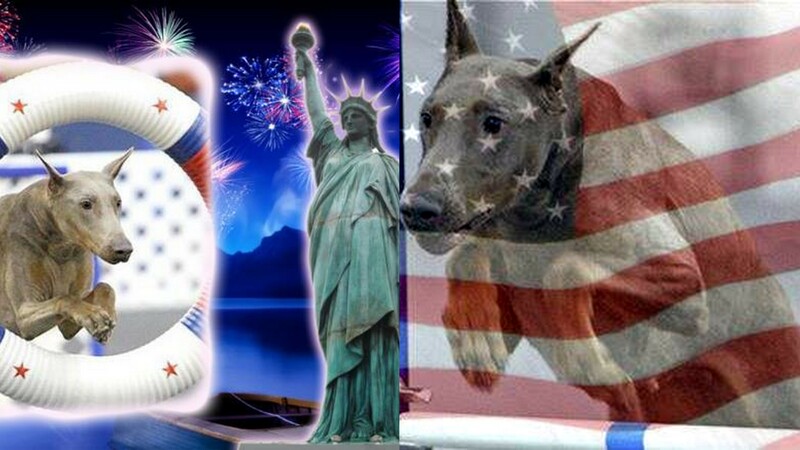 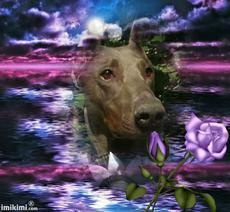 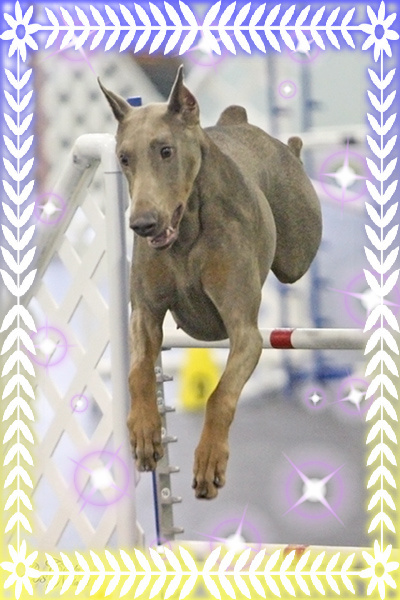 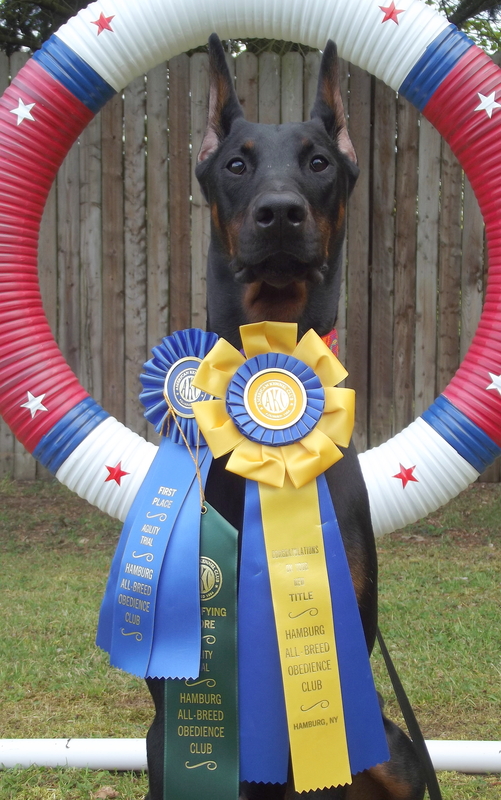 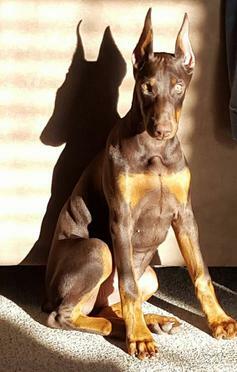 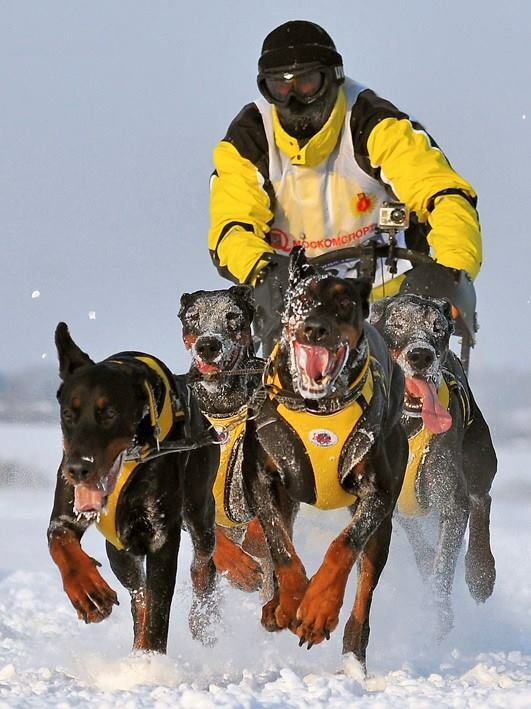 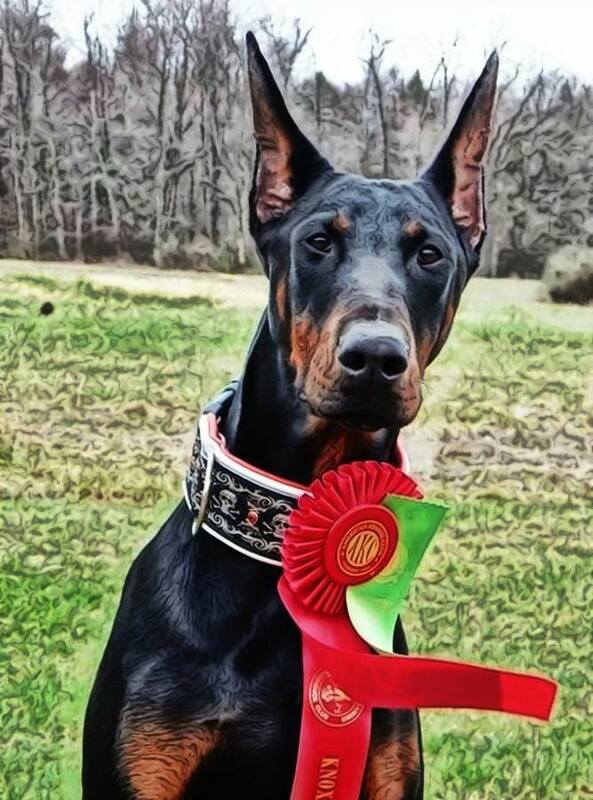 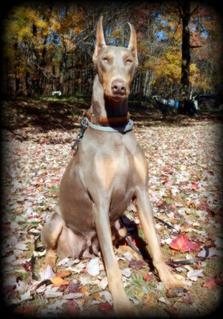 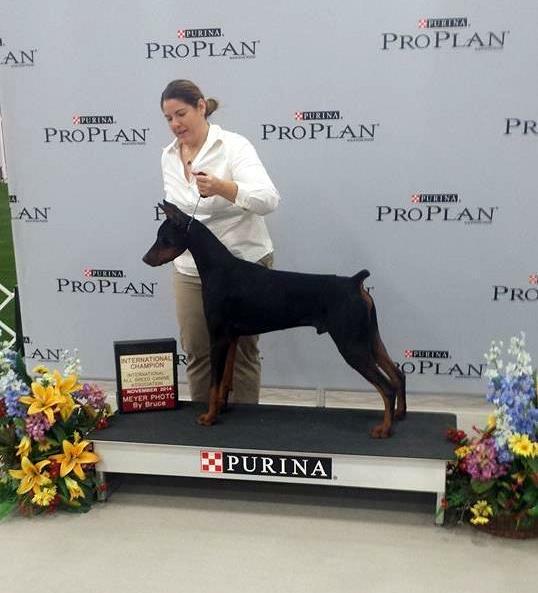 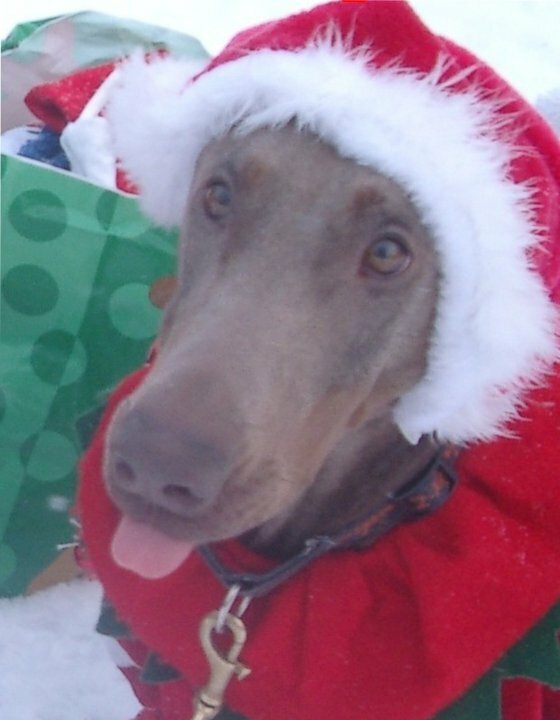 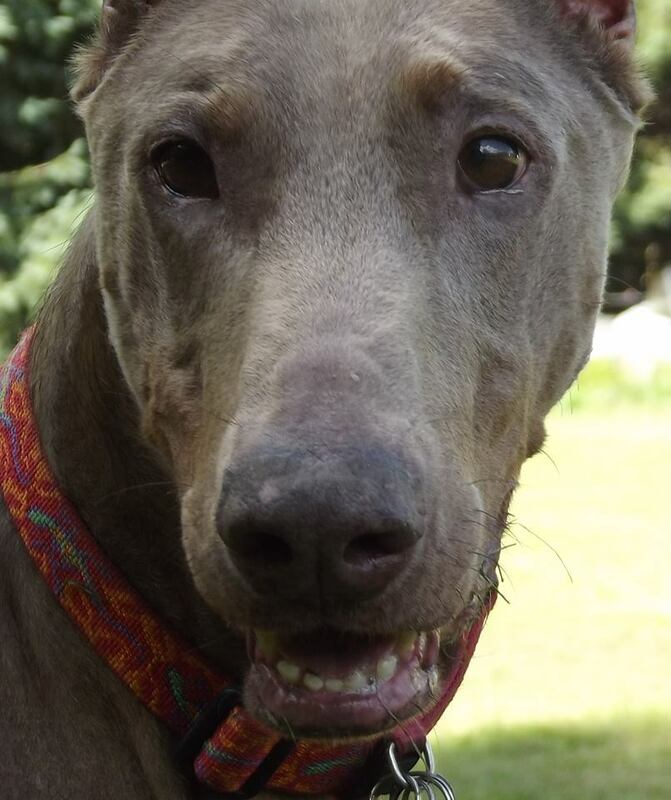 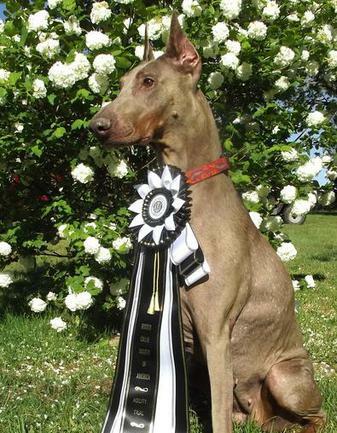 Multi Winner Club Races.Twice winner of the cup of Russia"Strong Spirit"
Meet "Coocha".She is my fawn/Rust Doberman.She has Ch.Show & working lines.She is the sweetest dog.Has the nicest temperament.Loves everyone.Kids ,other animals.Just a all around nice Doberman.I dont show her as i have so many now that i am showing.And i only have so much time to work and show so many dogs.But she is loved just as much as the other ones.She produces very nice looking Dobermans.She is very tall.And a really nice looking dog.Her last litter of puppies were so nice looking.She is a very nice show and working pedigree ! 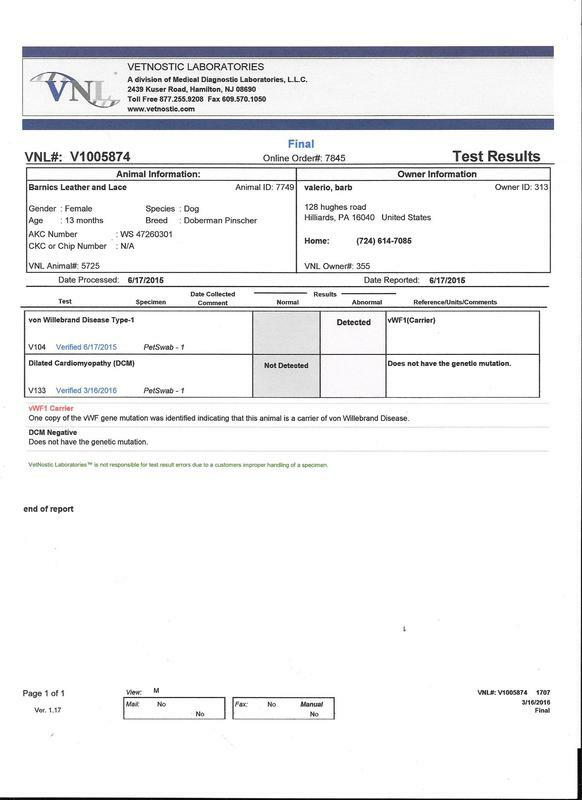 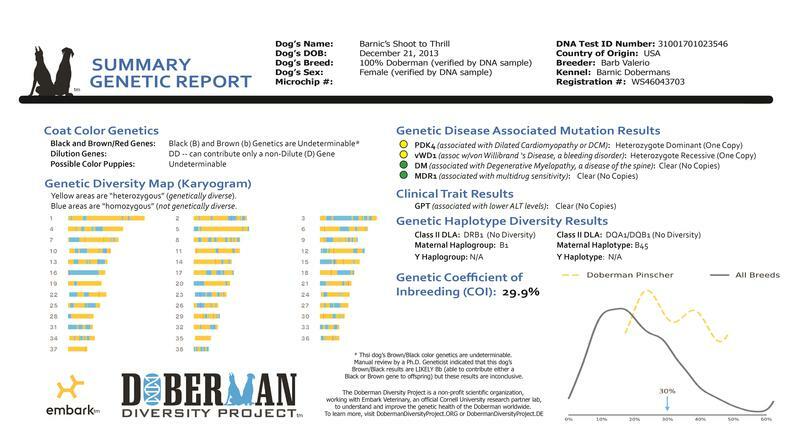 Barnic's Shoot to "Thrill" CD,RE,BN,TT,URO-1 VWD~Carrier,DCM 1 gene,DM~Clear,MDR1~Clear Fully Health tested. 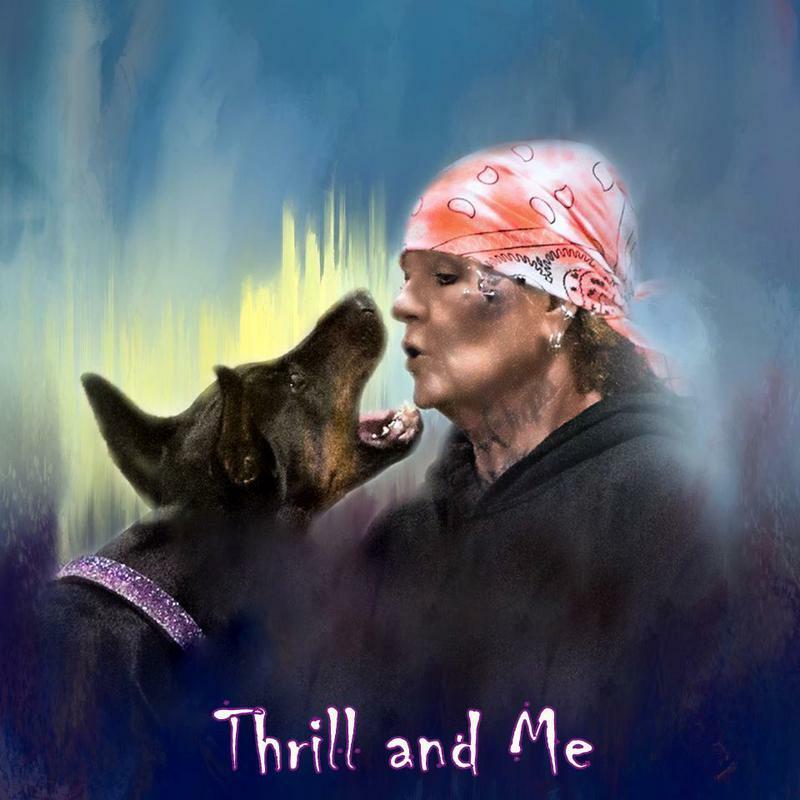 Meet "Thrill". 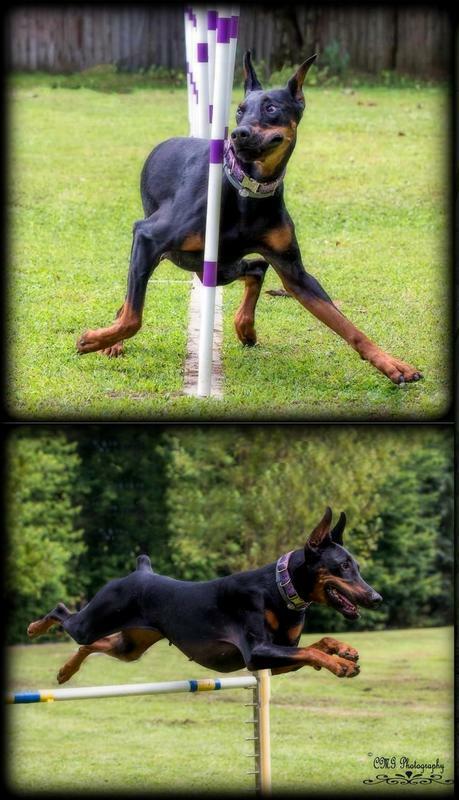 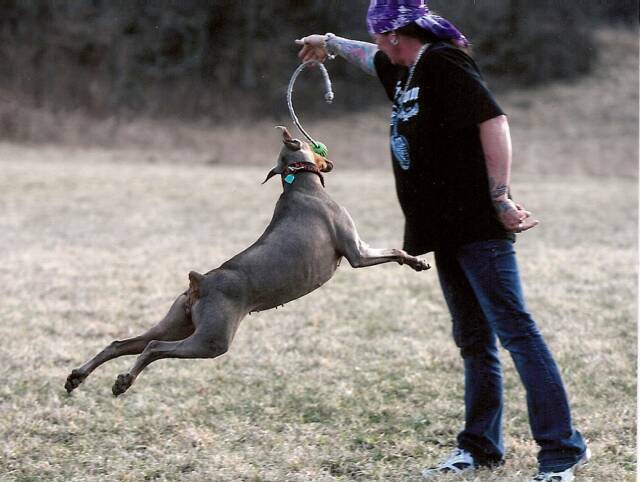 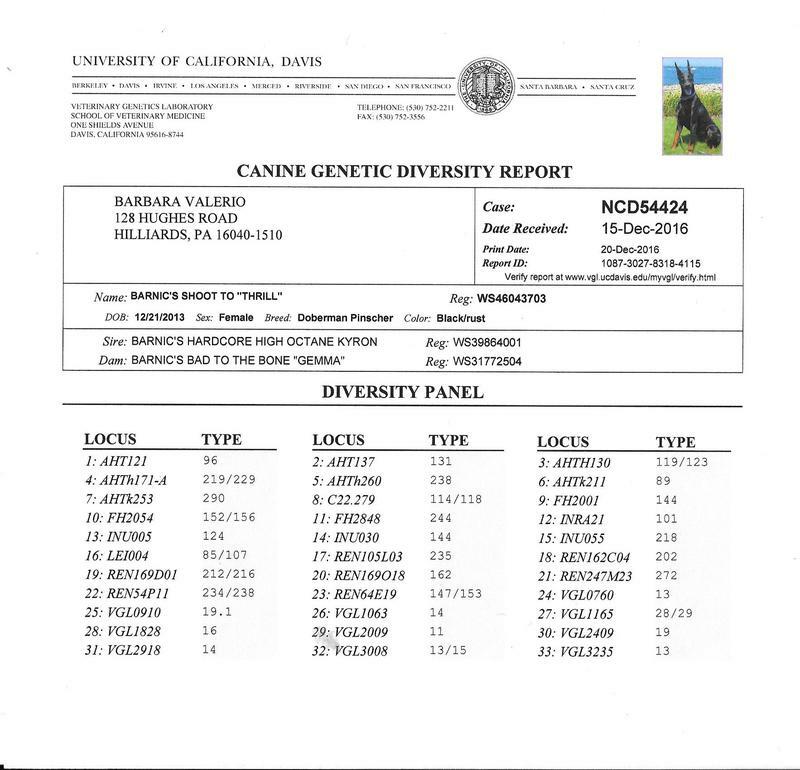 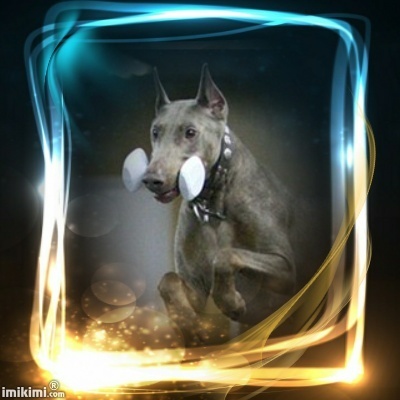 She is out of Gemma x Kyron.She is working on OB,Agility and also training in Mondio/Bite work.She is doing a wonderful job at it all.I am very impressed with her.She has a very high ball drive.Very willing to please you.Enjoys everything you do with her just like her Dam.She got her RN Title at 9 months old.She has a exceptional pedigree loaded with wonderful titled working dobermans.She has a very stable temperament.She is going to go a long way in the ring.She is a wonderful Dobe.Gets along with other dogs and loves people.She is now going for her CDX title and only needs 1 more leg.And is already working in Utility.She has a very high drive when it comes to working.And a very good protection dog.She learns so fast.She loves to work !And nothing bothers her when she is in the ring.This will be her 2nd litter coming up.I will be taking 1st pick on this litter.She is such a wonderful working dog.And being she is going to be bred to Gato ,with his pedigree these are gonna be some wonderful working puppies.She is a High Scoring dog in the ring.Has won High in trial 2 times ! 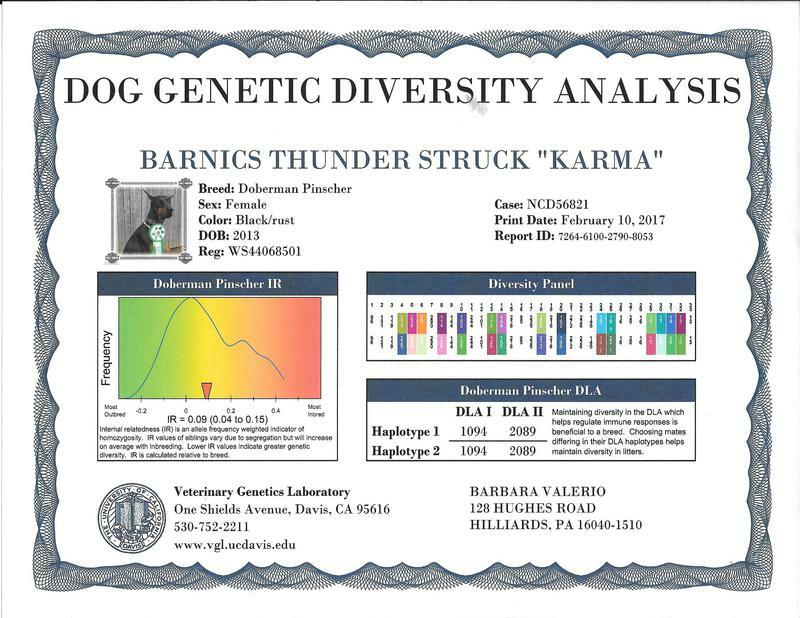 Barnic's Thunder Struck Karma CD,BN,RE,TT,CGC,URO-1 VWD ~ Carrier,PDK4 ~ Clear,CM~Clear,DCM-Neg,MDR1~clear.Fully health tested. 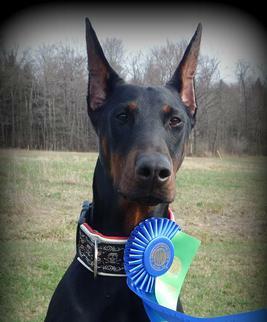 INT.Champion out of Taboo X Rigid produced.Brother to Gemma. 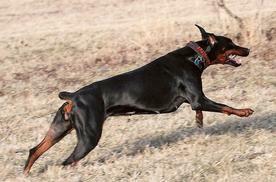 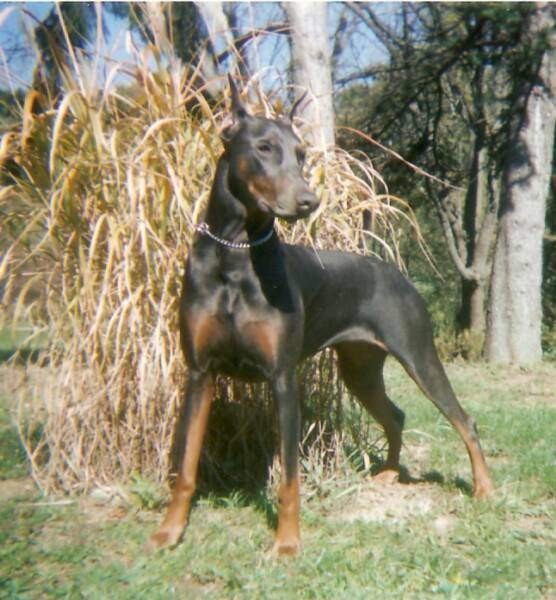 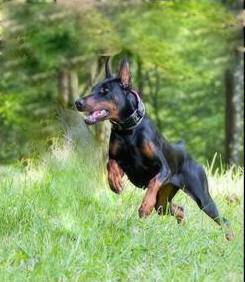 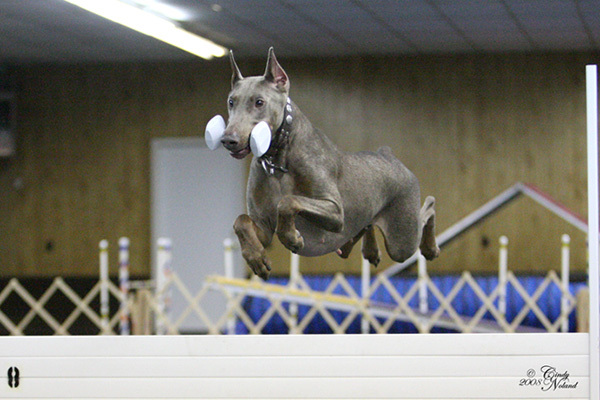 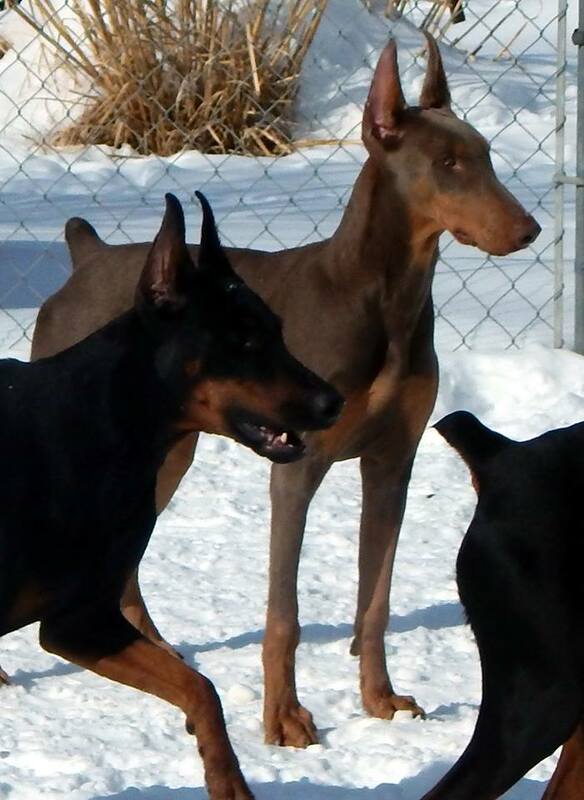 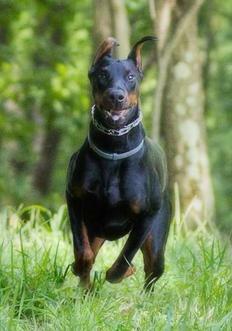 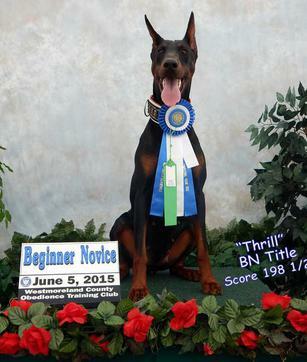 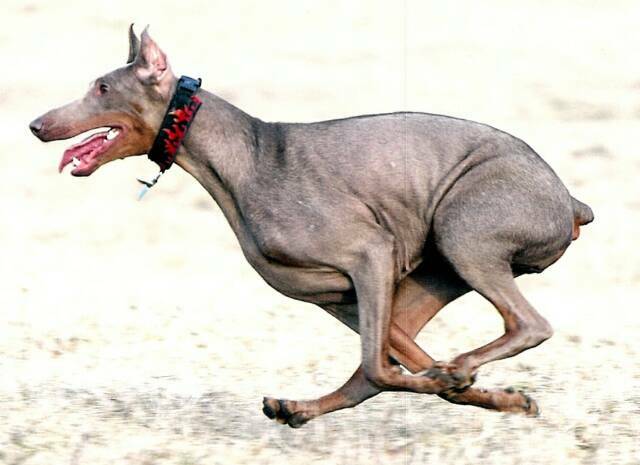 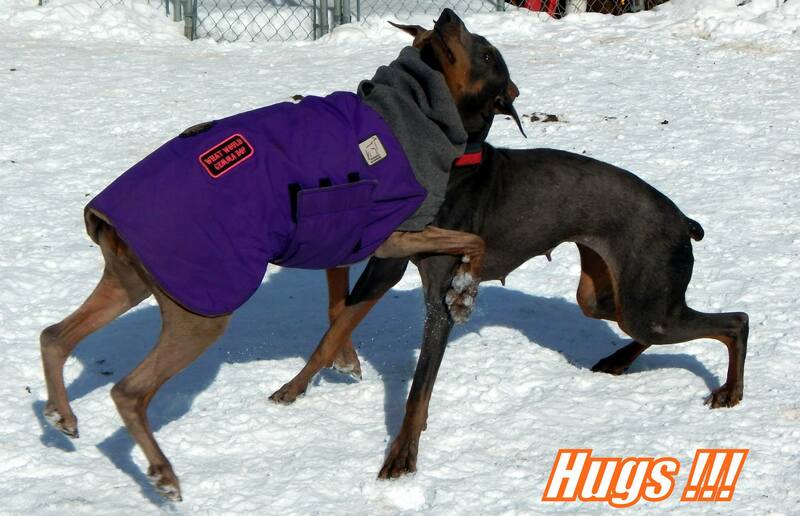 Thrill will be bred to "Gato" in 2018.Reserve your puppy now.They will be very nice working Dobermans! 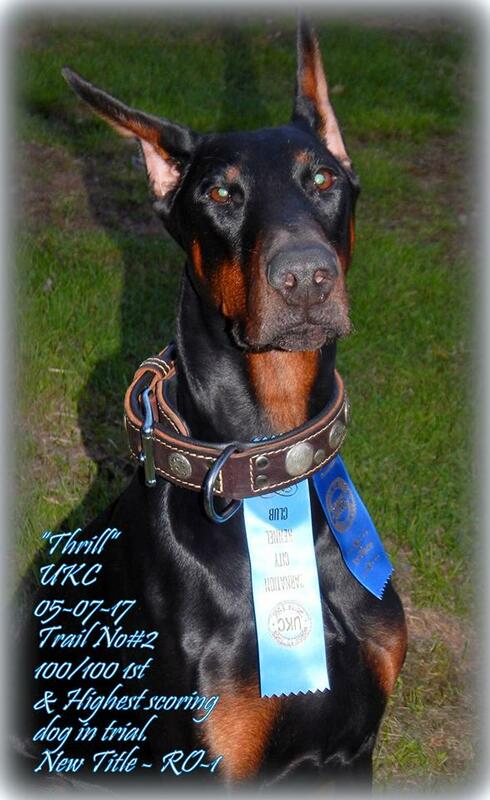 Deposits are Non Refundable.And are $600.00.I have one of Thrill x Gato pups.And she is a high drive wonderful working pup. 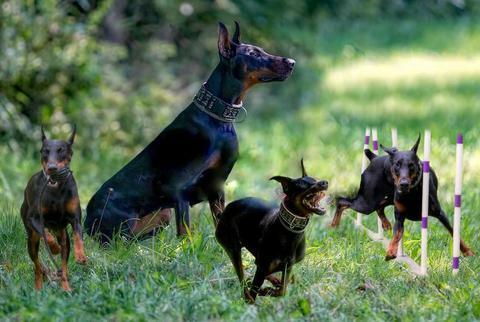 Some puppies from her previous litter. 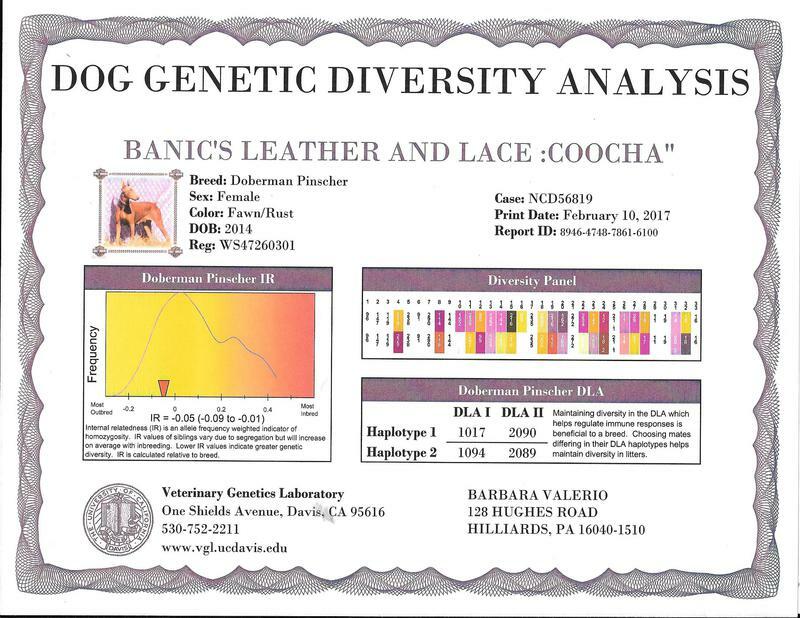 Coocha will be bred to Gato in the fall of 2018.Taking deposits now.Deposits are Non Refundable ! 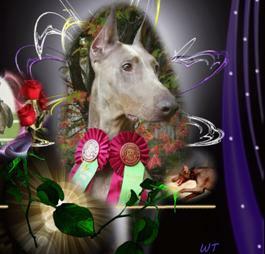 $600.00 deposit.It is good to get your deposits in early as the waiting list fills up really fast. 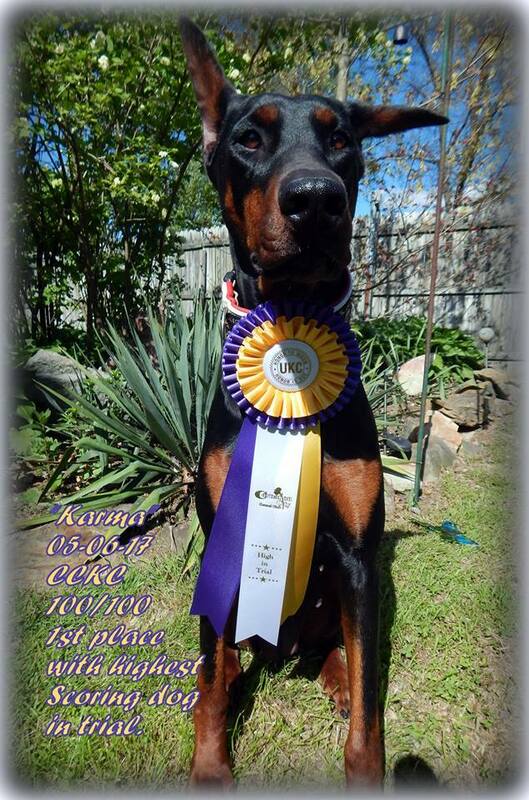 Karma will be bred 2018 in the fall.Taking deposits.Now.Deposit is $600.00 & is Non Refundable. 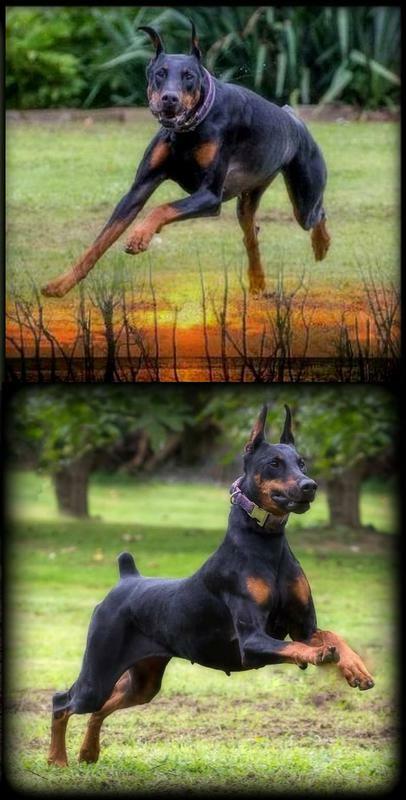 Thrill & Daughter out of Gato. 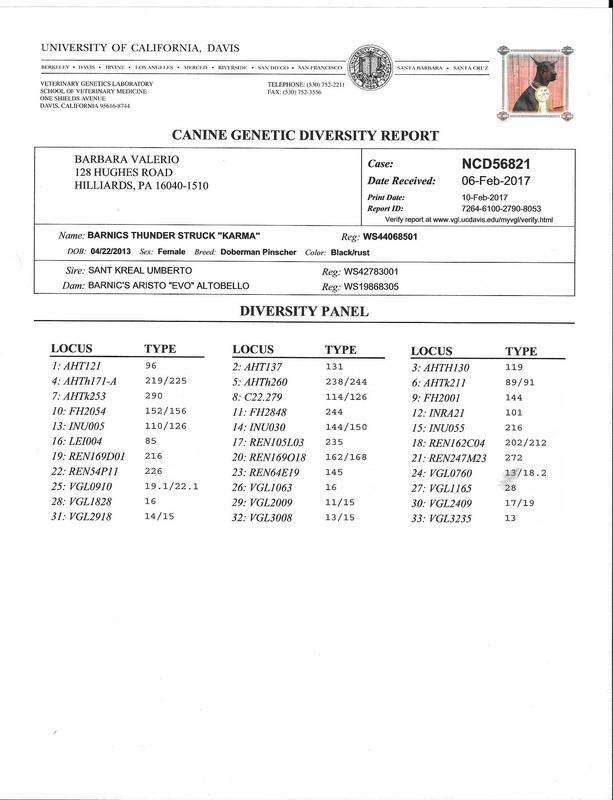 To see what puppies are available .Or when my females are due to have puppies. 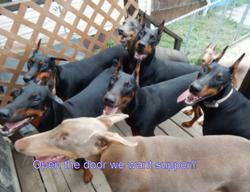 Please go to puppies available page. 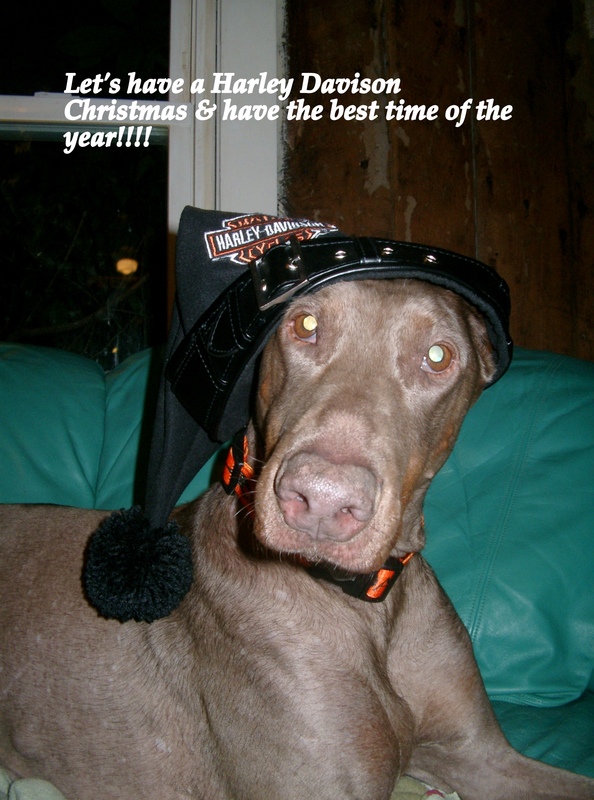 It is good to get your deposits in early .As the waiting list fills up fast. 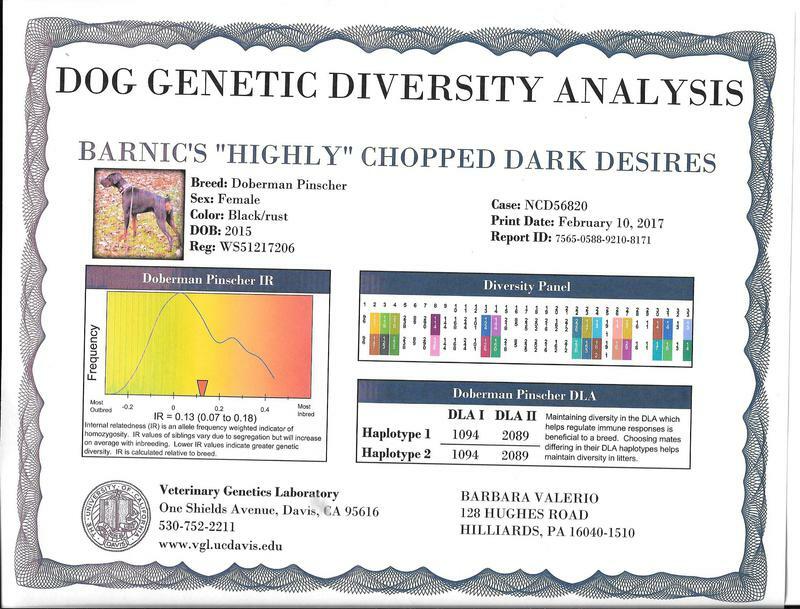 Barnic's "Highly's" Chopped Dark Desires. 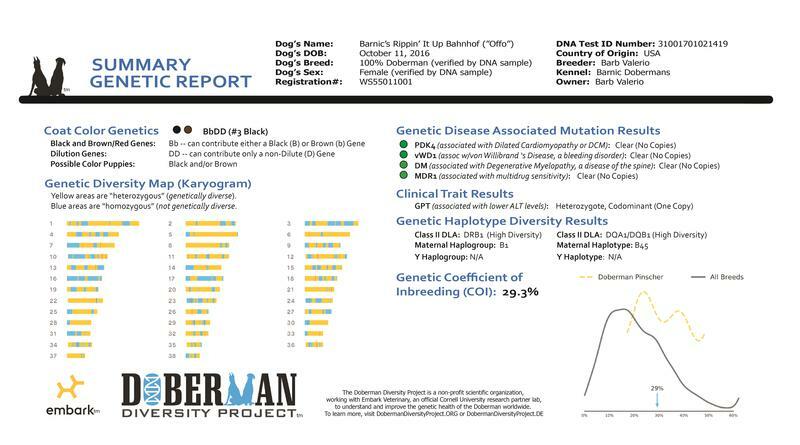 Highly is bred to Gato. 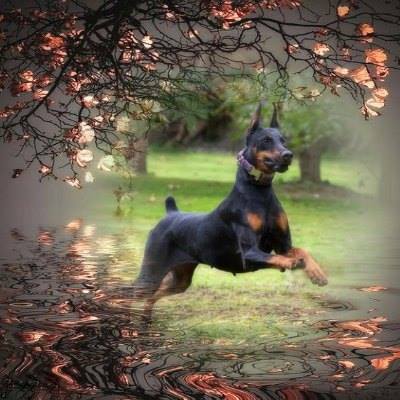 She is due at the beginning of Feb 2018.Taking deposits now.$600.00 Non Refundable Deposit. 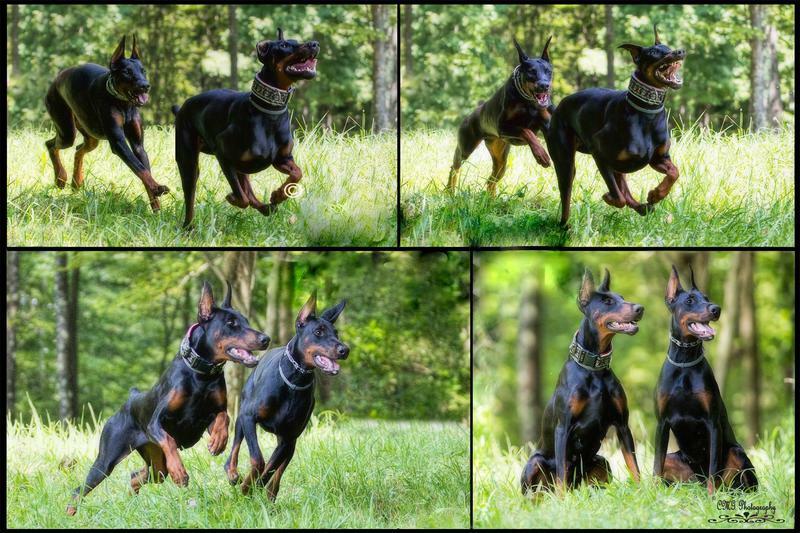 This will be really nice working puppies. 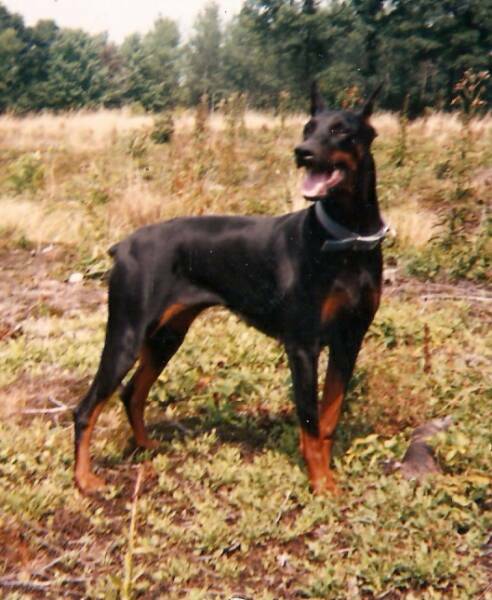 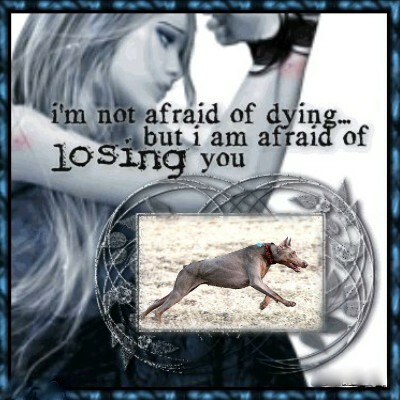 With great temperament.Stable,Fearless pups.I will be keeping a female. 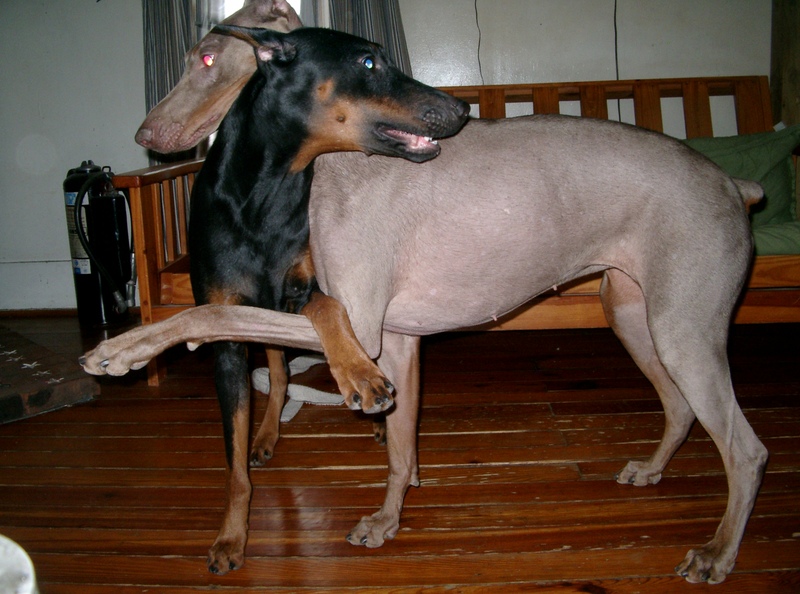 OFFO on the left. 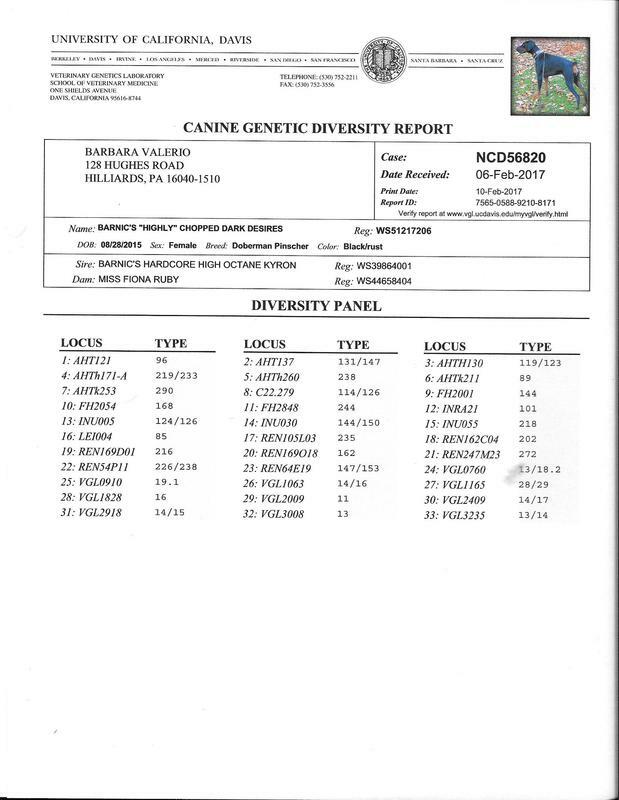 Her Dam on the right. 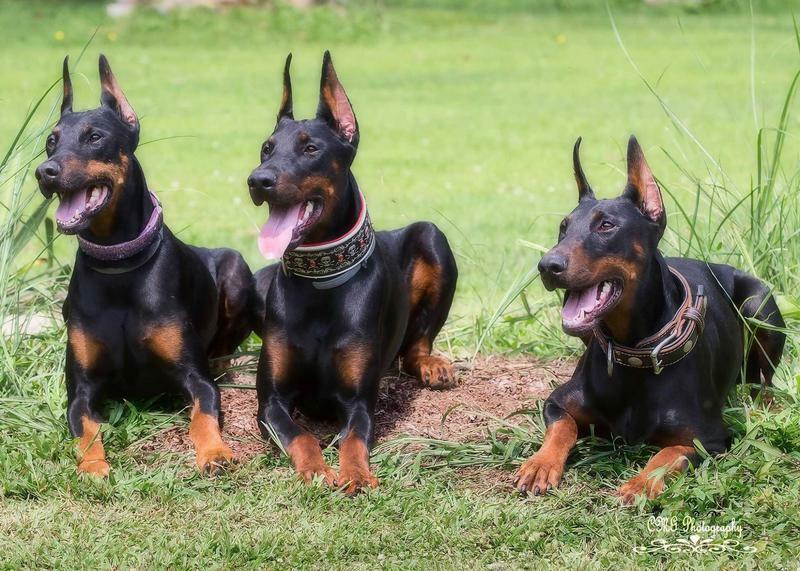 "OFFO" in the middle.Her Grandma on the left.Her Dam on the right. 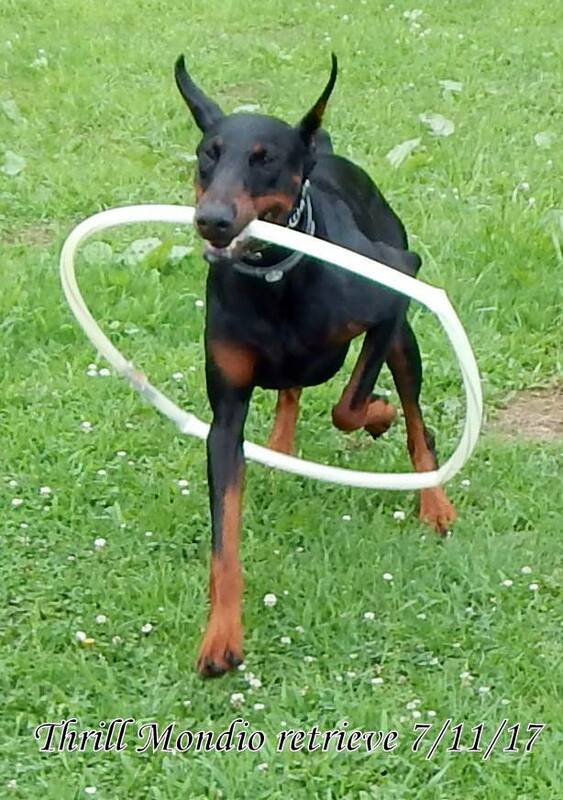 "OFFO" has excellent working lines.BAHNHOF blodlines.She started getting titles at 6 months old.She is working in OB,Rally,Agility,Mondio Ring sport.She is really good in Ring sport.She will will not be bred till she is older.And with a new working male i will be getting.Working lines on him too.She has a really high drive.Very protective.Will do anything you ask of her.Very nice Conformation.She shows in AKC,UKC so far.You need to have had Dobermans before with a high drive to be able to handle one of her puppies.These pups will go to working homes.OFFO is out of Thrill x Gato. 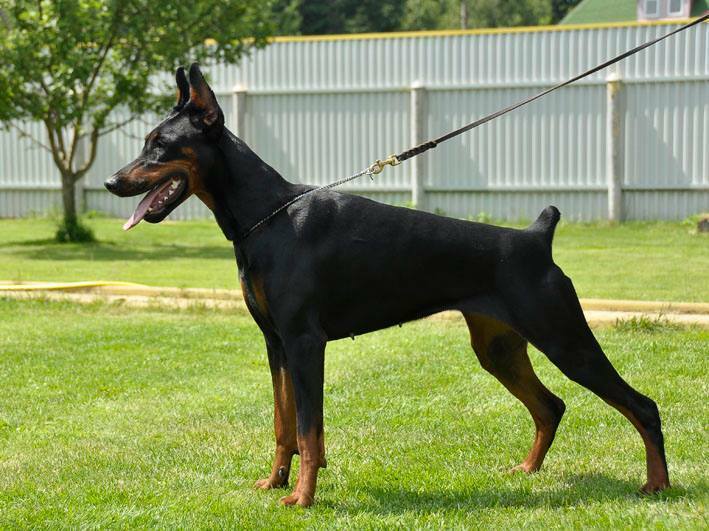 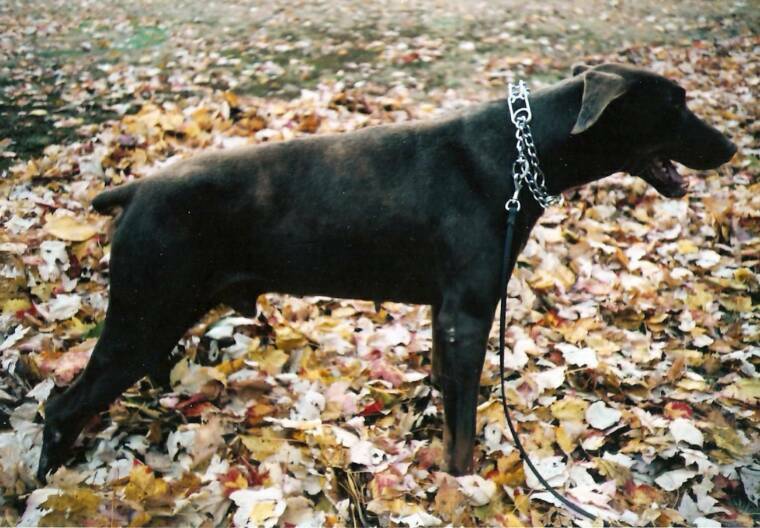 Will be bred between 2-3 years old.